The Dark Heart Viewer Package contains two key complex function fractal viewers, Dark Heart and Riemann Zeta, which are both a pleasure to explore and are also professional research tools for exploring virtually every conceivable complex function in the universe, along with their fractal dynamics. A simplified Dark Heart Mandelbrot Maps viewer for Android is also available for download, which has a range key example functionse. At first sight, Dark Heart shows you a portrait of a function that is to be explored in 4-D colour and when you click the screen switches to a Mandelbrot parameter plane view. You can then scale this by dragging rectangles to explore ever-diminishing parts of the fractal and click again to see the Julia set of the point chosen. Clicking again will switch between these two views and reset will take you back to the function. But the real interest begins when you select advanced controls and a drawer pane opens which expands the application into a research tool which can be used to investigate a vast variety of polynomial, rational and transcendental functions leading all the way to Riemann's famous zeta function and the full spread of esoteric zeta and L-function at the cutting edge of mathematical research in the Riemann Zeta Viewer. There are several colour schemes which are designed not just to be beautiful to watch, but to provide focused research investigations, by highlighting by colour specific periodicities, distinct attractors, irrational flows and other features key to investigating particular examples. The packages also provide saving and loading of images and parameters so an exploration can be recreated exactly and a suite of application scripts which enable the generation of movie image sequences for any process the mind can imagine. The help menu documentation enables you to check all the details of operation easily while using the app. The easiest way to show you what the package can do is to show you how it can represent key features of complex fractal dynamics in both a visually exciting and mathematically significant way. So let's go back for a minute to where this all began. If you just want to see what the package does, skip to Classic Quadratics. Note the PDF has clearer full size equations and full resolution images. Fig 2: Diverse Julia sets and the period highlighted Mandelbrot parameter plane of . For classic balck and white Julia sets see fig 2d below. (0, 3) in mode 3 to display period attractors by colour. (6, 7, (close to parabolic) 8, 16, 17) in mode 1 to display period. (10 - 13) mode 1 to display parabolic leaves and Siegel discs. (5, 15, 18) mode 1 to display dentrites. (1, 2, 4, 14) mode 4 to display dendritic and disconnected sets in colour.. (9) mode 0 displaying an explosion. In the early 20th century Julia and Fatou investigated the complex sets that arise when a function, say , is iterated over and over again for some fixed number c. For large z the points would expand to infinity. For small z, they seemed to settle into an attracting pattern, but what happened in between? What about the points that couldn't decide which way to go? Julia realized that the critical point, where the slope of the function is zero, was pivotal in determining the form of the Julia set, which he also recognized was a type of self-similar fractal like the Koch flake. It was only when computer graphics came along, that we began to appreciate that, on the boundary was a chaotic set - the Julia set - which had a variety of fractal forms, on which the dynamics was wildly unstable. The left-hand Julia set Jc shown here is the boundary between the points on the outside heading to infinity and those on the inside together forming the set of ordered basins of attraction, in this case heading into an attracting period 4 pattern of four periodic points, both regimes of the rule of order forming the Fatou set. The dark boundary is where chaos rules! The one on the right where, we can see the top and bottom halves are disconnected and so on ad-infinitum, so the whole set is completely disconnected Cantor dust. Chaos has three manifestations: (1) the butterfly catastrophe - arbitrarily close points iterate exponentially away from each other - making the process unstable and computationally unpredictable, like weather can be, (2) dense collections of repelling periodic points, and (3) topological transitivity - every small pair of open sets getting mixed so one iterates over the other. A deep and puzzling question then arose, which proved to have a stunning answer. Some of these sets were topologically connected, as is the one on the left, but others were fractal dust, sometimes in complicated swirls, as the one on the right. This question looks at first sight impossible to solve for such a fractal set. Mandelbrot used Julia’s insight about critical points to investigate c values where the Julia set is connected, using the critical point, where the function was neither shrinking nor growing - as on on a mountain top or in the bottom of a lake in topography, in this case z = 0. The idea is that these are the last points to escape to infinity, so if they don't escape, the Julia set must have encircled them. So instead of applying the above iteration to all z for a fixed c, we start with the critical point and apply the iteration to each c in turn . Mandelbrot, working at IBM, decided to make an atlas of the c values of all the connected Julia sets, and discovered the Mandelbrot parameter plane M - the set of c where Jc is connected, is also a fractal, through which we can graphically compute the answer to the topological chaos of Jc. Furthermore this atlas is universal to all quadratic functions since any quadratic iteration can be shown by scaling and translation to be conjugate to that of . M is sometimes called the most complex mathematical object in existence, because its dynamics are not simply self similar, but vary so that they represent in one fractal, the dynamics of all quadratic Julia sets. We can even prove the result in the following way. For very large values, z2 dominates c and maps a large circle onto an even larger one. Take a great circle big enough that z2 dominates, so that all the points are escaping to the super-attracting fixed point at infinity and step it backwards. Instead of squaring, we are now taking two square roots, so we either get a circle winding twice around itself, a figure 8, or two separate circles, just as we see in the boundaries of level sets using Dark Heart. However, if we reach a figure 8, we have a double root, which is also the critical point z = ± 0 and f(z)=c so c lies on the image of the figure 8 i.e. the first image circle escaping to infinity (see right), so we are outside M. The inverse images of each figure 8 will now be a pair of figure 8s, with graduated pairs of circles between, resulting in an infinite disconnection so the Julia set is otally disconnected fractal dust. If there are topological circles all the way down and there is no figure 8, we never reach the circle containing c so it is captured inside a connected Julia set and c is in M. M itself can also be shown to be connected by considering the fact that its own level sets are all topological circles, because it contains precisely the c-values where the Julia level sets are all circles. We can also see why the Mandelbrot set has dendrites. One-dimensional real number quadratic iterations can also have chaotic dynamics. These c values result in connected Julia sets lying along the x-axis corresponding to points on the period 2 dendrite, where the critical point iterates to chaos, or lands on repelling periodicities on the Julia set itself, which, although still connected, now has no internal basins (5, 17 in fig 3). The same situation pertains for every periodicity around M, resulting in a principal dendrite for each period bulb. Once we exit the bulbs and enter the dendrites, these periods become repelling and the critical point may become eventually periodic to a repelling periodic orbit at the tips and branching points of each dendrite, called Misiurewicz points. We can solve for these, e.g. for M2,1, we have (c2+c)2+c=c2+c, giving c = 0 and -2 at the tip of the period 2 dendrite. Inside each period-n bulb is a central super-attracting point, where for any point on the period-n cycle. But this means that one of the derivatives has to be zero, so the critical point. Hence the critical point is periodic with period n at this c value. Hence there is a point c in each bulb where , resulting in an equation of degree . For example for period 3, we get , giving 0 for the period 1 heart -0.1226 ± 0.7449i, for the two period 3 bulbs above and below and -1.7549 on the small satellite Mandelbrot on the main dendrite on the negative x-axis. We can also see why the Mandelbrot set is surrounded by an infinite number of satellite copies of itself, because points around -1.7549 behave under the third iterate f (3)(z), when renormalized by rescaling by f (3)"(z) /2, just as f(z), acts on M. Other points in the interior of each bulb have attracting periodicities. Since . There are no z or z3 terms since f is an even function. Applying the scaling , we have where , since we are now simply squaring and adding g(c), so it’s locally a scaling of f(z), by and rotation by since to first order . The periodicities associated with the bulbs on the Mandelbrot set add fractional rotations as mediants . Mediants correctly order the fractional rotations between 0 and 1 into an ascending sequence providing a way of finding the fraction with smallest denominator between any two other fractions. A way of seeing why this is so is provided by using a discrete process to represent the periodicities or fractional rotations. For example if we have 2/3 =110 and combine it with 1/2=10 by interleaving, we get 11010, or 3/5 so between period 2 and 3 we find a period 5 bulb. Because the periodicities grow exponentially on the boundary of M, particularly around parabolic periodic points at the base of the principal cusp or those at the base of bulbs (see left), whose Julia sets have fractal dimension converging to 2, the boundary of M has a space-filling fractal dimension of 2 as its local dynamics corresponds to that of the associated Julia set..
To derive the cardioid boundary of M , we set , giving . For the period 2 bulb we can solve for to get the cardioid again plus the circular period 2 bulb. Points on the boundary have more enigmatic behavior. Here the fixed or periodic point becomes neutral and at least two different outcomes can happen. For rational the neutral point has both attracting and repelling regions forming q quasi-attracting petals on the Fatou set, separated by q repelling arms on the Julia set and the fixed or periodic neutral point is in the Julia set, as in the illustration above, with the critical point orbit neutrally approaching the fixed point on the petals. Fig 2b: Critical point orbits using Wolf Jung’s Mandel application (Jung 2014) included with the package. Left to right: Period 4 attractor, a nearby period 1 orbit near a high attracting period bulb, a golden ratio Siegel disc with the critical orbit traversing its boundary, one radian digitated Siegel, a Liouville number neighbouring a higher period parabolic point, 'digitated Siegel' near period 4, period 4 parabolic orbit and a fractal strange attractor in the repelling Julia set on the dendrite at the limit of period 4 doubling. One can see in example 6 how the dynamics evolves. The critical orbit running close to period 4 at first converges towards the neutral point, but because it is slightly off period, as the parabolic approach stagnates, moves laterally until it approaches the repelling arm of the Julia set on the boundary, where it is very rapidly hurled up into the next period 4 pseudo-petal in an intermittency crisis. This implies the neutral point is already in the Fatou component. Mandel comes with a swathe of facilities complementary to the Dark Heart viewer, with an extensive set of tutorials in the help menu. For irrational values the situation is still not completely resolved. Golden numbers like the golden ratio , avoid becoming mode-locked to a dominant periodicity because their distance from any fraction of a given denominator q exceeds a certain bound: . The golden numbers can most easily be described in terms of continued fractions, which, when truncated represent the closest approximation by rationals: . Rotation angles with bounded ki’s far from rational values (continued fractions of golden numbers end in a sequence of 1's) have neutral fixed points lying in the inner basin of the Fatou set with an irrational flow called Siegel discs, and the critical orbit on the boundary.. But there are other irrational values associated with large or unbounded ki’s , which lie very close to rational numbers, so that for every n there are p, q such that These include Liouville numbers such as = 0.7656250596 defined more generally by where an infinite number of the ak’s are non zero and those of sequences like 0.01001000100001000001… and 0.1000100000000000001… which are associated with Cremer points where the irrational value cannot be linearized into an irrational rotation and forms invraint sets called “hedgehogs” containing cantor combs of radial hairs (Shishikura 2014), reminiscent of the exponential fronds in fig 9. These Julia sets remain enigmatic and largely uncharacterized. Fig 2c: External rays and potential levels displayed using Wolf Jung’s Mandel application (2014) included in the Dark Heart package. Douady and Hubbard discovered a number of intriguing relationships depending on the critical point that index the features of the bulbs and their dendrites in terms of the critical points. Because the Mandelbrot set is connected, with a simply connected complement, the complement can be mapped to the complement of a unit disc. E can thus define the external angle, the angle of the ray from the unit disc that corresponds to each ray from M. There are intriguing ways to calculate these angles for the bulb cusps and key points on the dendrites. Inside each period-n bulb is a central super-attracting point, where for any point on the period-n cycle. But this means that one of the derivatives has to be zero, so the critical point. Hence the critical point is periodic with period n at this c value. Hence there is a point c in each bulb where , resulting in an equation of degree . For example for period 3, we get , giving the period 1 heart and the three locations of the small period 3 dendritic Mandelbrot island on the main dendrite and the two period 3 bulbs above and below the main heart. If we consider a critical point in either a periodic orbit or an eventually periodic orbit, we can encode the dynamics as a binary ‘decimal’ setting a 0 for each iterate in the upper half of the local traverse of the 0/1 and 1/2 rays, which are asymptotic to the positive and negative real axis. When we expand this decimal as a power series it gives the external angles of the cusps of the bulbs and dendritic Mandelbrot islands and the Misiurewicz dendrite tips and branching points. Rays emerging from cusps and dendritic islands all have external angles fractions of the form because of the repeated binary decimal associated defined by their periodicity, associated with each step in the period squaring and hence doubling the angle. E.g. . Furthermore these lead to every odd denominator fraction as a result of Euler’s generalization of Fermat’s little theorem where a, n are coprime and is the number of integers less than n coprime to n. For example for 9 we have 1, 2, 4, 5, 7, 8 give , so and is actually an external angle of the period 6 bulb. By contrast, those from eventually-periodic Misiurewicz points have even denominators because the non-periodic initial iterations cause an irreducible power of 2 in the denominator. For example the ray to M2,1 at c = -2 gives . There are many such processes which represent chaos in the real world such as the dynamical crisis, or verlust, of rabbit populations, where we have a function representing exponential breeding cx in a finite pasture (1-x). This gives all manner of periods 2, 4, 8 etc. as the growth rate c increases through boom and bust due to overpopulation and starvation then entering chaos and other strange periods. Once we put this process into complex numbers, we get another Mandelbrot set - a simpler version of the one in fig 1, shown (1,1) in fig 10b - and a collection of Julia sets, showing that these different real phenomena are all part of one complex process. So now lets have a look at how Dark Heart handles the diverse Julia sets of the classical Mandelbrot set, which have proved surprisingly difficult to capture due to their varied forms and unstable dynamics. Julia sets come in diverse forms. They can consist of a single connected internal basin of attraction (7) have an infinite number of internal basins (3, 6, 16) and semi-dendritic (15, 17) which are generated from satellite Mandelbrots). Julia sets can be dendritic and have no interior basins but still be connected (1, 2, 17). They can be totally disconnected fractal dust (4, 14). They can also display behavior on the boundary between these states. For example a point right at the base of a bulb (8, 11) is called parabolic because it is bifurcating between periods (e.g. 1 and 5 for 11) and instead has neutral points surrounded by petals drawing towards the points and radiating arms on the Julia set repelling away. In between all the bulbs in golden mean type locations, which avoid all the periodicities associated with the fractional rotations of each bulb, are Julia sets with a neutral irrational rotation (13) called Siegel discs. Between these cases are emigmatic irrationals close to rationals whose dynamics have not yet been classified. (10, 12) show hybrid irrationalstates close to parabolic (11). One can also find parabolic Julia sets right on explosive bifurcation such as on the cardioid cusp (9). Three Julia journeys. The first runs just outside, the cardioid in mode 1, shows escape from chaos in grey and periods in colour. The second, right on the cardioid in mode 5 highlights irrational flows and occasional parabolic periodic sets. The third in mode 0 illustrates an explosion out of the main cusp. Although the irrational flows are hard to find in the plane, on the curve they are much more common than the paraboic petals which are countable as the rational fractions corresponding to each bulb, while the irrational flows are an uncountable infinity on the cardioid. By contrast, Cantor dust Julia sets even though they are totally disconnected have an uncoutable infinity of points in the chaotic set. Originally different techniques were developed to handle these cases. The simplest algorithm is the level set, where we colour the exterior by how many steps it takes to escape a large circle, leaving the interior and boundary filled dark. This doesn�t work well either for complex dendritic sets which needed another technique called the distance estimator. Nor did it work for parabolic sets which required inverse iteration. Howeer these techniques are focussed on the quadratic and don�t easily generalize to all functions. Dark Heart viewers use a modifed level set algorithm which works for any kind of function and has several colour schemes suited to highlight all these types of Julia set and in addition to portray internal periodicities by colour (mode 1 in 6, 7,16,17), capture the dendrites and fractal dust using non-linear colouring schemes (modes 1 and 4 in 1, 2, 4, 5, 15,17,18), distinguish distinct fixed attractors if they exist and to sample irrational flow velocities and highlight parabolic petals (mode1 in 10-13). One can also follow the way periodic lobes are mapped by colour (mode 3 in 5) and distinguish multiple attractors in rational functions such as Newton's method. The default (mode 0) is a useful general exploratory mode with non-periodic sinusoidal colouring. The view of the Mandelbrot set is also coloued to highlight the dendrites which connect the main body to all of the Mandelbrot satellites, demonstrating that the quadratic mandelbrot set is connected, despite having fractal dimension 2 the highest the 2-D complex plane can accommodate. The interiors are coloured by incipient periodicity, which begins to track as period say 3 within the period 1 bulb as we approach the period 3 bulb because the algorithms finds the third iteration close enough at the cutoff. This makes it easily possible to see the relationships in the periodicities. Starting from period 2 to the left we have period 3 at the top and bottom and successively 4, 5, etc. as we move towards the cardioid cusp as the rotation under iteration goes through 1/2. 1/3 etc of a revolution on each bulb. At the same time, between each pair of bulbs there is a fractional rotation that works by mediants - p/r and q/s become (p+q)/(r+s) so between 2 and 3 is a 5 and so on. We can also see how the periods multiply on sub-bulbs as oscillations of the base frequency. Fig 2d: Left: Modified Inverse Iteration. Right: Distance estimator algorithm. Included with the DH package are several additional applicaitons which perform complementary functions. There are two applications, modified inverse iteration and the distance estimator algorithm, which enable the display of high-resolution black and white images of Julia sets of the quadratic Mandelbrot set, such as the ones shown above. They aim to define the actual chaotic set, rather than colour the basins on either side. These are capable of generating high resolution images on a large monitor andprovide some of the most accurate correct depictions of the actual Julia sets available. Modified inverse iteration gives accurate portraits of Julia setswhich enclose internal regions of their complementary Fatou sets, including parabolic sets on the boundary. The distance estimator likewise gives very accurate depictions of dentritic Julia sets on the Mandelbrot boundary. The wave function method viewer gives another kind of depiction of several types of Julia and Mandelbrot set, in which a wave function is repeatedly transformed by the forward mapping, in a way which relicates the modified inverse iteration effect, since the forward mapping of the wave function values has the same effect asthe inverse mapping of the end points. by 2π/3, since if then and so and by induction all iterates also are just rotations of the original. It has Julia sets distinct from those of fig 2. A topological space is locally connected if every neighbourhood (open set of a point in the space) has a connected sub-neighbourhood. The regions in the lower inset indicate that the mandelbar is not locally connected. In fig 3 we can see how the colouring can also enable us to chack the base periodicities of satellites and hence to see how each of these correspond to a cycling series of locations where each has a period a constant step up, forming a cycle of periods surrounding the base dendrites. The settings colour periods up to 35, making it easy to explore fine grained details and understand their dynamics on blow-up. In Dark Heart viewer, we can alter the settings for this function to portray any function of the form by setting R,I to be e.g 3,0 instead of 2,0. We can then see each of the germ periodicities for multiple roots of higher degree clones of our original function, each of which is analogous to the quantum wave functions of an atom because each integer power winds precisely one revolution more around the origin. These form the root possible single critical point kernels which appear in all more complicated examples to follow and they represent the only kinds of solutions we can have, except for an exponential plateau and the inversions of these solutions in the presence of singularities, such as those caused by negative powers of z. In fig 4 are shown each of these along with the period 6 Julia sets of a period 3 sub-bulb of a period 2 bulb on each set to show their dynamics are essentially similar except for the k-fold geometry. All of these have well-defined boundary curves of their central region, so Dark Heart has a script which can generate interesting movies of the changes in the Julia sets as we move around the boundary, or out of the cusps. Fig 4: Elementary higher powers and their functions and parameter planes. In fig 4 the first three rows show function, Mandelbrot and Julia views of , k = 2-5 and showing the principal power 'atoms' forming the stable critical points of a diversity of functions, with main body boundaries following well-defined exponential curves. To derive these, we set , giving , which for k = 2 is the dark heart cardioid with one cusp neatly winding through two revolutions as we follow the boundary curve. For the period 2 bulb of the quadratic case we can solve for to get the cardioid again plus the circular period 2 bulb . Thus we can see the central basin is always a dark “heart” having k-1 cusps, with bulbs having k-2 cusps, supporting k revolutions as we move around the boundary, counting the base journey, equalling the k-fold winding of the function, illustrated in row one. Fourth row: Mandelbrot views of second order atoms which arise in a region in which two or more dark hearts of critical points overlap giving full continuity (next section). Left to right: , , both of which have a hidden infinite dark heart due to a second critical point a z = 0 mapping to 0, and k = 2-4 (black inner bodies with full continuity) consist of a fractal curve with quadratic cardioids emerging from the cusps and fractal symmetries of the order k, rather than the k-dimensional bulbs and well-defined body boundary curves of the upper sequence.Row 4: Mandelbrot views of second order atoms which arise in a region in which two or more dark hearts of critical points overlap giving full continuity (next section). Notice the last three have outer bodies in the k +1 form but bulbs in the k-form due to the unusual c parametrization. Transitions between parameter planes of c(z+k)z(z-1). In the above video, firstly we move from k ~ -2 to 1, passing a crisis in cz(z-1)2, at k = -1, cz2(z-1) and its rocky coastline at k= 0 and cz(z+1)(z-1) at k = 1. Then we spin twice on a tiny circle around the crisis at k = -1 to see the Mandelbrot arms rotate. Then we zoom into a bulb and follow the Julia sets as they cross the rays on the bulb, zooming in again to see the tiny rotational disconnections at the very centre at z = 1 explaining the crisis. Finally, when we view the Julia sets in full retraversing the same path, the focal disconnections are too small to be seen. Fig 4b: The parameter planes of c(z+k)z(z-1), passing (a) cz(z-1)2, (b) cz2(z-1) and (c) cz(z+1)(z-1) display radically different dynamics. Fig 4b shows three key parameter planes from the video above. While in (c), both critical points give the same parameter plane, resulting in first order bulbs although there are two separate criticals, in (b) there is a second order dark heart rocky coastline parameter plane where both criticals give rise to connected dynamics enclosed in a first order plane with double bulbs. By contrast, in (a) there is a unique crisis around the double zero z = 1, again giving a zero derivative and hence a critical that maps to 0 inducing an infinite parameter plane, but coinciding in this case with the multiplicative idenity for c. In this case, every neighbouring value of k = -1 has a finite parameter plane with a rotational connectivity crisis caused by the Julia sets forming two sets of ‘spokes’ with an infintessimal hub winding around the two closely spaced zeros, resulting in alternating connections and disconnections, as we move c across the fractal bulbs, resulting in the fractal banded arms in each bulb. In the limit as k approaches -1, the combined plane still has first-order bulbs, because all adjacent k-values have a finite parameter plane for the near vanisihng critical z ~ 1. The above functions don't really give us any kind of generalized higher degree Mandelbrot set because they all have degenerate critical points. To see what really goes on in higher degrees, we need to explore more general polynomials. While with quadratics, the family forms a complete parameter space of all quadratic Julia sets under equivlence by affine transformations, cubics require two free complex parameters to do so, meaning we need an effectively 4-dimensional parameter space. We also have two interacting critical points, so new phenomena arise. There are two approaches to this problem. The one used predominanly in dark heart is to choose a parametrization with one complex variable, such as the cubic , which has a pair of distinct critical points spaced apart and examine the combined behavior of the two critical points for this parametrization. We shall examine this first. The alternative is to form ‘slices’ of the 4D parameter space involving a single complex parameter which fixes the behaviour of one critical point and examines the variations in the other. We will give two examples later. We can make the same arguments for cubics and higher polynomials that we made for the figure 8 in quadratics, showing that each critical point is measuring the connectedness of the Julia set, which is fully connected only if neither can escape. If the cubic has distinct critical points, a great circle where z3 dominates will either have entirely simple closed curve inverses, as in the connected quadratic case, or it will reach a local figure 8 where there is a double root, which must also be one of the critical points as the slope is also zero, therefore this critical value will escape and we have a disconnection. In general were will also be a second inverse image where there is a second figure 8 of the other critical point resulting in a further disconnection to fractal dust. In the degenerate case such as f(z) = z3+c where we have coincident critical points, we will have a triple point, resulting in the escape of c and a complete disconnection in a single step. We now have to contend with the fact that we don't have just one parameter plane, but two overlapping ones, one for each critical point and we going to see that each is measuring the connectedness of the Julia set, which can now become disconnectd and/or scrambled chaotically in two different ways by the oscillations of the cubic iteration. Dark Heart deals with this by calculating the critical points and iterating the function over each parameter plane and presenting a superimposed prolile of the two, so we can select any point and see the consequences in terms of connectivity and winding. Only in the black central region in fig 5 will the Julia set be entirely connected. You can also view each one separately by checking dF and using the derivative portrait zeros to locate and select the critical point using hold. Fig 5: Dynamics of the function . Fig 5 (1-12) shows a variety of new features which enter into the chaos with . The double parameter plane now has both black regions where the Julia set is connected, orange regions where there is a fractal disconnect in one of the factors and a light yellow exterior where both are disconnected. Julia sets above illustrate (1) a single disconnection with the other factor of period 9, (2) a connected set with two different periods, (3, 4) two sets in the right hand cleft with rapidly changing dynamics between the two, (6) a doubly connected Julia set of period 3 at a Mandelbrot satellite on the rocky coastline of the black set and (7) a set on the edge of the lower cleft dendritic on one factor and disconnected on the other. Julia journeys in an out of the Mariana trench. But two major new features also arise. The first is interference between the dynamics of the two critical points. In each of the 'Mariana' trenches formed by the four deep cusps the higher and higher periodicities of each are being perturbed by the other, fragmenting the bulbs of each and leading to a newly chaotic dynamic, reminiscent of the mode-locking perturbations that have thrown all the asteroids in any sort of periodic relationship with the orbit of Jupiter into the other planets. In (10-12) we can see blow-ups of the two separate parameter planes which not only show chaos in superposition but each on its own is responding to the perturbations of the other. This results in extremely small changes in the c values strongly altering the relationship between the periodicities in the Julia sets. Also the Mandelbrot satellites are no longer confined to dendrites but can also be connected through solid regions on the inner boundary where the bulbs are replaced by rocky coastline dark hearts, as on the dendrites of the quadratic case, except now attached to the main body via the cusps. (13-16) for k=0.2 show the erosion of higher period bulbs as k increases, with concretion of dendrites to periods 3, 4 and 8 due to a dominant periodicity on one critical point as for period 1 in (5,6). Below is shown a movie of how the period 3 bulb of , each of which is shown in figs 4 and 5. The period 3 cubic double bulb and its satellites separate, with (a) the left lobe in the movie becoming the dark hearts on the rocky inner coastline of the distant critical point and (b) the right lobe becoming the outer bulbs of the nearer critical point. The same picture applies to the cubic satellites on the dendrites, the right set splitting to become (a) the dark hearts on the smaller fractal rocks of the inner coastline defined by the distant critical and (b) the dark heart islands of the nearer critical, with the the left set splitting, with one set (a) descending to the adjacent rocky coastline of the distant critical as the left lobe did, and the other (b) continuing as outer bulb dendritic satellites. The dark hearts of each critical point, being nuclei of attractive winding periodicities, are atomically robust to interference from the other critical point and pass unaltered through such changes, while their associated repelling dendrites become perturbed and undergo bifurcation through an irrational flow to a base period Julia component. The fractal rocks on the coastline associated with each dark heart thus originate from the concretion of dendritic webs that have become frozen to the main body attracting period of the other (adjacent) critical point. with Julia journeys showing off mode 1's capacity to model periods, Cantor sets of escaping flows and irrational rotations. The above movie shows how these phenomena arise as we move from f(z) =z3+c to f(z) =z3-z+c, each of which is shown in figs 4 and 5. The period 3 cubic double bulb and its satellites separate, with (a) the left lobe in the movie becoming the dark hearts on the rocky inner coastline of the distant critical point and (b) the right lobe becoming the outer bulbs of the nearer critical point. The same picture applies to the cubic satellites on the dendrites, the right set splitting to become (a) the dark hearts on the smaller fractal rocks of the inner coastline defined by the distant critical and (b) the dark heart islands of the nearer critical with the the left set splitting with one set (a) descending to the adjacent rocky coastline of the distant critical as the left lobe did, and the other (b) continuing as outer bulb dendritic satellites. The dark hearts of each critical point, being nuclei of attractive winding periodicities, are atomically robust to interference from the other critical point and pass unaltered through such changes, while their associated repelling dendrites become perturbed and undergo bifurcation through an irrational flow to a base period Julia component. The fractal rocks on the coastline associated with each dark heart thus originate from the concretion of dendritic webs that have become frozen to the main body attracting period of the other (adjacent) critical point. Fig 5b: Per1(0), Per2(0), Per3(0), colour coded by period, with five pre-periodic examples and the Neut(λ) plane of Siegel discs, with example Julia sets. These can be accessed as special cases under rational in the help file. Now let’s turn to the ‘slice’ method of investigating higher degree Julia sets favoured by classical research. In figure 5b are shown slices of the 4D so-called cubic connectivity locus which fix one critical point to periods 1, 2 and 3. These are highlighted in mode 1 to emphasize their local conjugacy with the dynamics of the Julia sets. We can easily confirm that the illustrated function has a super-attracting fixed critical at 0, (derivative 0 with period 1 hence Per1(0)), causing all its Julia sets to have period 1 for this critical while the dynamics of the other critical at 2/3 can vary. We can likewise confine one critical point to be period 2. We set the two critical points to be 0 and c so we have: . Now let’s stipulate that , so that we have , giving . This has the parameter plane shown in fig 5b top right, with dark hearts suspended in period 2 domains. The selected Julia sets for several values of c show that one critical point component of the dynamic is period 2 while the other can take any configuration, from period 3 through Cantor dust to compound period 2 configurations. As shown lower left in fig 5b we can do likewise for period 3 with , resulting in the parametrization , giving rise to a spectrum of locations. all of which have one critical point inducing period 3 dynamics. Lower centre in fig 5b are four pre-periodic examples. For example, PrePer(2,1) for which , with parametrization . Complexity increases rapidly, so for in PrePer(2,2) giving rise to branch cuts and multiple parameter planes. These cases give rise to Julia sets with dendrites, tails and geometrical doublings. Dark Heart also includes the period 4 case, which is right on the limits of computability, generating a 42 page formula in Mathematica after Matlab froze, which when computationally streamlined results in four multiply split parameter planes, generating a comprehensive collection of period 4 coupled Julia sets. In fig 5c is shown the superimposed parameter planes with selected Julia sets. The equations of the splits cannot be computed as they are of degree greater than five. Fig 5c: Four parameter planes of Per4(0) superimposed, with a selection of Julia sets. This set can be exploredin rational 20 - see help file.. The last example right in fig 5b examines the parameter plane Neut(λ) of , the golden mean value, which forces one critical point to give rise to a neutral point rotation of a Siegel disc, while the other can vary at will, as illustrated in the various Siegel discs both continuous and discontinuous, one harbouring a complementary period 3 component. Rational values can likewise be chosen for gamma resulting in parabolic examples. Again this parameter plane has domains conjugate to Siegel discs. In the case gamma is a Cremer point, this parameter plane is connected but not locally connected (Buff & Henricksen 2001), due to it being quasi-conformal with quadratic Julia sets of the form . Fig 5d: The quasi-degenerate slice (Parameter file in quintics) has the critical point at 0 mapped into the other at 2/3, resulting in a parameter plane with bulbs having ‘quartic’ double cusps. Dark Heart extends the cubic example to a series of higher degree functions, which can be modified in the advanced settings to both change the degree and alter the separations between critical points, leading to a huge diversity of examples. Application scripts are also provided which can portray any polynomial up to degree 5 either in terms of its coefficients, by solving for the critical points, or by setting the positions of each of the four critical points and calculating the coefficients. Several of the examples in advanced settings with symmetries can go to higher degrees and also have negative powers, leading to infinite singularities. Fig 6: Dynamics of higher degree polynomials illustrating overlapping parameter planes, graded disconnections and multiple Julia dynamical systems. In fig 6 we examine f(z) = z7 – 0.5z + c with a cascade of five dark hearts in successive rocky coastlines, ending in a quadratic bulb, illustrating six stages in the fragmentation of a degree seven Julia set, with the seventh stage being a completely disconnected Cantor dust. On the right are blow-ups of showing multiple interference zones yielding Julia sets below, each of which show the interaction of four dynamical systems. For example, in the lower one, we have three periodic systems in green red and pink and a Cantor dust disconnection of the multiple 'violins'. Fig 6b: Symmetries in polynomial dynamics of f(z) = zk - z + c for k = 3-8. One can use z^m-nz+c, and (z^m-n)(z+c) in modes 3, 6 or 7 with orbit trap selected to explore moduli spaces. In fig 6b we explore the effects of symmetry, the use of moduli spaces and the dynamics of odd and even powers. The polynomials f(z) = zk – nz are unique in that they give rise to symmetric parameter planes. For n = 1, for every k the functions f(z) = zk - z + c have parabolic Julia sets at the origin, with multiple cusps and petals, in bifurcation between periods 1 and 2. We can see this because |f’(z)| = |kxk-1 - 1| = 1 for z = 0, so 0 is on the boundary of the period 1 basin. In (a) the positions of the critical points show that for even k, the odd number of k-1 critical points means that none are diametrically opposite one another, while in the odd case the even k-1 criticals are opposite. This leads to completely distinct Julia dynamics, in which for odd k we have k-1 petals, but for k even, we have 2(k-1), as illustrated in (f). We can see why this is this in (b) when we examine the individual parameter planes of each critical point for even k and find they have an intact period 2 basin opposite the main period 1 basin, ecause there is no diametrially opposite critical point the the rotational interference of the others tend to cancel, while the odd k have rocky coastlines there due to interference from the antipodean critical, as we noted for k = 3 in fig 5. In the even case, this causes the central (black) region where the Julia sets are fully connected (c) to be ‘stellated’ and split by multiple cusps from the adjacent period 2 basin. In the odd case we have a central region punctuated only by the global cusps of the remote period 1 basin, which we can see intersecting for k = 3, but gradually become invisible for higher powers. We can explore this further, by explitiong the symmetry of the functions by a rotation by 1/(k-1) of a revolution when the overlapping parameter planes are combined, as shown in (c). We can thus introduce a mapping to another C-plane, where C = c1/(k-1) , to form the moduli space of equaivalence classes of c under the rotational symmetry, as illustrated in (d). In particular, this transformation is a Mobius transformation which conjugates with the polynomial function, so we can generate its own parameter plane which in each case now looks like a set of overlapping dark hearts. This perfectly represents all the possible Julia sets up to rotation by 1/(k-1) of a revolution, but it also involves geometrical scaling so that for higher values of k the black region (inset for k = 4-6) becomes shrunken and distorted about the origin, while preserving the fractal sturctures and topological dynamics completely. When we examine the cases in (d), we see that for even k, the origin is always at a cusp in a dark heart region penetrated by a complementary region, while in the odd case we find a central region penetrated only by the universal vertical cusps of the remote period 1 basin. There are also an intriguing array of rational functions which have infinite singularities as well as critical points which disturb the dynamics in sometimes un predictable ways and which provide new interesting dynamical examples. A famous one is Newton's method in which we find the zeros of a function by iterating from a start point x , going up to f(x) and then down the slope f'(x) to the point . Virtually always this closes in on the zero but not every time. There is a chaotic set of points that can't decide what to do and we can explore it for the complex cube roots of unity. It turns out that we can describe any cubic in the form . Dark Heart applies this generalized to to get Newton's method for the complex k-th roots of unity. In fig 7 the parameter plane of Newton on the fifth roots of unity is shown (1), iterated from the repelling critical point at 0. This puts the origin on the chaotic Julia set, but other c values not on the Julia set mostly iterate into one of the five attracting roots. (2) shows a parameter plane blow up with a degree-4 Mandelbrot kernel, and (3) the Julia set of the iteration for c = 1, to the fifth roots one in each of the large colour-coded regions with fractal replicates eventually mapping onto these. This provides a unique fractal 5-colour mapping problem in which every point on the boundary of each region is simultaneously touching all of the other four regions because every boundary point is a fractal boundary intersection point of all regions. In (4) is the parameter plane of , which for golden mean rotations in the left sector, provides the Herman ring - a unique example of an annular irrational flow in the Julia set (5). Notice also that the left hand portion of the parameter plane surrounding the singularity has both inward and outward pointing bulbs, leading to inversions of the Julia set dynamics. In (6) parameter planes and Julia sets for provide an example of symmetries generated by each of the two powers. In the (5,3) case there are 5-1=4 baby dark hearts. Each of the intervening 4 concentric domains has 5+1 outer sub-domains and 3-1=2 inner sub-domains adding to the 5+3=8 fold rotational symmetry of the Julia sets with 5 outer and three inner sub-domains. Filigree journeys around z3+n/z for small n.
Another intriguing phenomenon is the way a singularity can introduce fractal perforations in an existing iteration. In (7) the parameter plane of shows the dark heart perforated in the centre by the effect of the singularity, which has also fragmented the critical points into a closely spaced set of 3, generating overlapping parameter planes. A Julia set from the period 3 bulb (8) shows internal perforation by a latticework of 'holes' with multiple dynamical systems in the interior due to the multiple critical points. In (9) the iteration shows almost completely scrambled parameter planes generating the diverse Julia sets shown in (10). (11) Shows and a Julia set of period 3, with similar power-based symmetries to (6). You can also see here the corresponding Mandelbrot and Julia sets for cz2(1-z)n n=5,7 displaying even closer affinity with hyperbolic space due to the fractional rotation of the second factor. Notice the patterns in the bottom left Mandelbrot set whose dark hearts are so relatively tiny(the actual set is 80000 across) that you can see them only in the inset centre. Notice that while the lower right Julia figure has islands growing by 3*2n ... 3, 6,12 etc. the Mandelbrot figure lower left grows by 2+1+2+4+8 ... or 2n+1 ... giving 3, 5, 9, 17 etc. (12) shows the ghostly outlines of the repelling version of Newton’s method , dominated by escaping points, leaving only isolated regions of connectivity, with a Mandelbrot island of base period 2 and a period 6 Julia set. (13, 14) show parameter planes and Julia sets of using the Milnor C-script and function. (15) Shows the parameter plane and Julia sets of . Several of the functions in advanced settings admit singularities from negative powers of z so there is a good library of varied rational functions. (16) Shows the Julia set of f(z) = z2 + (1/16) z-2 is a Sierpinski carpet. (17,18) Julia sets of c(z+1/z+2)+1 (Mandel1.txt in milnor) and c(z+0.5/z2) (Rational 23) showing internal dynamics and fractal tilings of the complex plane in mode 3 showing how the attractors separate the plane into fractal tilings (Parameter files in rational fig7-17, 18). Both cubic polynomials and quadratic rational functions have two critical points, where the derivative is zero or infinite, leading to a 4D moduli space (2 complex parameters), under equivalence by Mobius transformations, to completely describe the Julia sets of every function. However, as we have seen with cubics, it is possible to form a slice consisting of functions fixing the behavior of one critical point, to form a 2D parameter plane constituting a section through the higher dimensional space, in which the remaining critical point is set free and we can study the dynamics of the Julia sets. The critical points can have one of four behaviors adjacent if they both fall into the same attracting set, bitransitive if each falls into the others basin, capture if one falls into the periodicity of the other and disjoint if they have entirely separate basins of attraction. The k periodic regions of the infinite component differ in their behaviours. For example the main light-coloured bulb in Per2(0) in fig 7b has adjacent behaviour. Each successive period 2 generation daughter reverses between this and bitransitive. The first is chosen to be the quadratic Mandelbrot set because it has fixed critical point zero and a super-attractor at infinity (the north pole of the Riemann sphere), leading to an infinite period one basin (enclosing the northern hemisphere) surrounding the Julia set. In the period two case, . In period 3, using , giving the above equation, with critical points at 0 and infinity. This provides symmetric Julia sets rather than the asymmetric model based on . The symmetrical period 4 case is special because it has a square root in the c parameter defining f, which leads to a double split parameter plane, generating the two parameter planes shown in the third row of fig 7b forming a “fermionic” loop where one cycle through the elliptical cut in the centre of the each plane takes you to the complementary plane. Together these planes cover all the period 4 locations on the classical Mandelbrot set, as shown on the left. There is also a topological homology between the Julia sets generated by Medusa and those generated by the fermionic plane, as shown in the second and fourth rows of fig 7b. The period 4 case is special because it has a square root in the c parameter defining f, which leads to a double-split parameter plane, generating two parameter planes shown in the third row of fig 7b forming a “fermionic” loop where one cycle through the elliptical cut in the centre of the plane on the right in fig 7b takes you to the complementary plane. Together these planes cover all the period 4 locations on the classical Mandelbrot set, as shown on the left. There is also a topological homology between the Julia sets generated by Medusa and those generated by the fermionic plane, as shown in the second and fourth rows of fig 7b. Fig 7b: Top row: Periodic 2 and 3 slices and Julia set matings. Right: Two Medusa matings. The lower three rows show the split parameter plane Perf4(0), with Julia sets at the starred locations, showing topological homology with corresponding Medusa matings (3,2>2 <-> 1/7 6/15, 5,4 <-> 1/31 7/15, 3,4 <-> 1/7 1/15 and 4,4 1/15 7/15) confirming the techniques can generate conjugate dynamical systems of shared matings although the parameter lanes are generated in completely different ways. Notice that 1/5 1/7 and 1/7 1/5 are inverse matings of one another and the parameter pane of the latter below is completely different from the above period n parameter planes having been created through the Medusa algorithm where the Julia set always has coordinate 1+0i. Third row right is a Julia initated from a Mandelbrot satellite. Bottom row: Medusa portraits of 1/4 1/7, with dendritic tree detail, 1/7 1/4 and 1/4 1/511. Right: slice of PrePer(2,1) with example Julia sets. Parameter files for the Medusa poartraits are included in the Matings folder. The parameter plane functions are included in the rational section of the help file. Each parameter plane gives rise to Julia sets, in which a new phenomenon, called mating appears. You can think of a quadratic rational function as the quotient of two quadratics, one of which has dynamics which is dominant near zero with the other dominant near infinity. Because the complement of a connected quadratic Julia set is a topological disc, two connected Julia sets can be entwined together on opposite hemispheres of the Riemann sphere. Consequently they can form complementary Julia sets “mated” together. Almost any pair of connected Julia sets can be so mated except for those in conjugate limbs of the Mandelbrot set. Thus we can see that the boundary of a mated Julia set is penetrated by periodic basins, as well as having periodicities of its own, just like the period 2, 3 and 9 basins in the top row with inner Julia components of period 5, 4, 4 and 9 respectively. Mating is an extension of the picture we saw with cubic polynomials where the Julia sets had two fractal components, one corresponding to each critical point. A mating simply moves the two critical points around to be at or close to 0 and ∞. The cubic Newton’s method map is likewise the limit of a mating between two polynomial Julia sets of z3-z and z3+az2. Any two quadratic Julia sets can be mated via a rational function of the form f(z)=(az2+(1-a))/ (bz2+(1-b)) provided they aren’t in conjugate domains of the Mandelbrot set, when the two cannot form a Riemann sphere, so cannot mate in C.
The Medusa algorithm to find a rational function, which mates two rational Julia sets of any pair of external angles p/q and r/s, (Boyd & Henriksen 2012) uses the combinatorics of a spider consisting of a set of periodic points and external angle rays in the orbit of the critical point c. A medusa consists of two spiders forming northern and southern hemispheres of the Riemann sphere sewn together along the equator. This makes it possible to define a convergent sequence of coefficients (an, bn) defining in limit a rational function mating the Julia sets defined by the two external angles. Note that if the coefficients give an infinite Julia set (initally black but with escape only off it becomes visible and unbounded), one can use (1-b, 1-a) in the place of (a, b) to get a finite Julia set, as 1/f1-b,1-a(1/z) = fa,b(z). You can use the Wolf Jung's Mandel app included with the package to find where the external rays meet the Mandelbrot set geometrically to decide the Medusa fractions to explore. Period k bulbs and Mandelbrot satellites have rays with fractions n / (2k-1). The Medusa iteration may diverge or remain unstable for some fractional angles, including some with even denominators. As shown in fig 7b many Medusa matings are visually and topologically identical to those of slices, but some are subtly different because Medusa throws up an equivalent or shared mating, such as the period 4 Julia denoted with a # in fig 7b. Mandel included with Dark Heart can show spiders in action. Medusa can also generate matings involving dendritic Julia sets by using external rays with even fractions, landing on the intersection points of repelling dendrites, as shown in the bottom row of fig 7b. Notice that 1/7 1/4 has an unbounded Julia set because the point at infinity is on a dendrite. One can also generate sets like 1/4 1/7 by selecting an appropriate c value in Per3(0). To generate sets like 1/7 1/4, we need to construct a pre-periodic parameter plane. In fig 7b is shown the pre-periodic slice PrePer(2,1) , which results in the point at infinity being in the chaotic repelling domain, since pre-periodic iterations arrive at Misiurewicz points on repelling dendrites. The complement of the finite attracting Fatou component defined by any period bulb is thus entirely Julia, with all other points in the parameter plane leading to chaos, rather than escape to infinity in the super-attracting basin of infinity. The Julia/Fatou portraits thus extend all the way to infinity. Finally it is possible to have equivalent matings of Julia sets generated from different periodic regions in teh quadratic paramter plane with differing external angles, such as 3/15 3/7 between satellite Mandelbrots has Julia sets which are simply rotated versions of those of 1/7 6/15 arising from period 3 and 6 bulbs. Other Julia sets which may appear to have a fractal geometry may also be topologically equivalent and hence shared matings. A more detailed comparison of the actual matings (pdf). Fig 7c: Dynamics of the function with both finite and infinite critical points. Parameter files for (7) and (9) are included which can also be used to fully explore the example. High resolution Julia images of 7 and 9: 4500x5130 - 23 mega pixel jpg image - second 6000x5130 pixel jpg image - high res fig 7c with discussion. The slice function in fig 7c demonstrates the dynamics when we have to take account of both the critical points with zero derivative and those with an infinite derivative. Here we have and since , we can effectively use 0 and 1 as the critical points. Moreover, we can see by swapping 0 and ∞ by in both the domain and range that , so the parameter plane of ∞ is simply the parameter plane of 0 flipped in the c direction. This results in the combined plane shown in (1), with the two individual planes in (3,4). The combined plane forms a symmetrical figure 8 with pairs of bulbs running in two series (2) in the interior of the black chaotic region, which consists of points which fail to head to any attractor from either critical point. Close inspection however reveals that, the two, apparently symmetrical, sides differ. Superimposing the left and right for the period-16 bulb (2i) shows that, although these overlap, there are key differences. The expanded superimposed period 13 and 16 bulbs (5,6) have clear patterns indicating critical point interference. Intriguingly for the period 13 and 16 cases, the bulb of 0 intersects both with regions of identical asymptotic period (13 or 16) in the bulb of ∞, and with c values where ∞ is pre-periodic, or chaotic and hence in the Julia set. Note the two critical points differ fundamentally in their behavior, because one is a zero of the derivative which is not a solution of the numerator and the other is simply a solution of the denominator. This means that the Julia sets on either side have distinct dynamics. As rational functions with a critical point at 0 and ∞, the Julia sets manifest as matings. (15,16) for example show complementary matings between a jagged period 3 Julia and a rounded period 2 Julia. In 15 on the left the exterior is partof the rounded Julia but the complementary Julia 16 on the right has a gagged exterior and rounded motifs internally. Similarly (17,18) display a 1,3 mating inverting to a 3,1 rabbit in the complementary set. In the above cases, when a c value is chosen, where both criticals have the same asymptotic period, as in (7,8 c = ±0.995627+1.937037i) and (9,10 c = ±0.731013+2.280174i), (Rational fn 24 - 3.1, parameter files in rational fig7c7, 9) the Julia sets on both sides, although geometrically distinct, appear to be homeomorphic to one another and each is hence automorphic to itself, by an inversion exchanging 0 and ∞, as indicated by a blow-up of the central regions of (9,10) in (9b,10b). These thus appear to be automprphic matings. However, if a pre-periodic point is picked in a bulb on either side (if c is picked on the left -c will have precisely the same effect and equivalent location on the right), the right-hand Julia sets will be fractal to 0 as in (11) and the left-hand Julia sets will become unbounded (fractal to ∞, as in (12). (13) & (14) show a value very close to the intersection of the Julia arcs lower-right in (5), giving a right-hand Julia with a double intersection very close to 0 and a left-hand Julia expanding toward infinity with a double 13 period array, confirming the general picture. Transcendental functions exp, cos and sin expand the repertoire to include a variety of new phenomena. In fig 8 top row are (A) the escaping fronds of f(z) = ez + c with increasing periods colour coded (B). The Mandelbrot set here is black. In (C) is the Julia set of ez/e. The Fatou set here is in black. The Julia set, in colour, consists of an uncountable infinity of closely packed disjoint curves of fractal dimension 2, forming a Cantor bouquet. When the main basin has a higher period, the bouquet can become pinched causing the curves to intersect, as in the period 3 example (D). The exponential function, shown to have a plateau in fig 4 can be perturbed to include polynomial critical points. In (1) is shown the parameter plane of the critical point z = -1 of the function , which has small clearly defined period 3 bulbs giving rise to period 3 Julia sets (2). These also have green period 6 exponential bays resulting from the plateau critical at negative x, as indicated by the green fronds in the period 3 bulb (inset centre). When we change to the multiplicative version in (3) we find we have a local parameter plane very similar to that of the polynomial cz(1-z) illustrating the difference between additive parameter planes and multiplicative ones, which operate more simply by scaling rather than translation. A period 3 Julia set is shown in (4). Fig 8: Transcendental parameter planes and Julia sets. The trigonometric functions sin and cos are combinations of rotated complex exponentials, which are themselves periodic in the imaginary direction e.g. . By superimposing a positive and negative exponential we arrive at a transcendental function with a chain of quadratic maxima and minima along the x-axis and consequently the parameter plane of (5) looks almost exactly like a chain of copies of the cubic function in fig 5 with corresponding two factor Julia set kernels as shown in (6). Rather than isolated Julia sets as we see in polynomials we now have networks of kernels connected by dendrites, or in a Cantor set arrangement. In (7) we see the multiplicative Mandelbrot set and a Julia set of , which displays combined quadratic and quartic dynamics and in (8) Superimposed Mandelbrot and a Julia set of , at c = 1.5 + 0.15i, which shows three different kernel types in a chain. Descending through the upper period 4 bulb of c(z-tan(z)). To explore transcendentals with both zeros and infinities, we now look for tractable functions involving the tangent. The final example in (9) is the function , which has derivative and thus has alternating zeros and infinities of the derivative. Applying the zero criticals, we arrive at (9) which like the Herman ring example of fig 7, has inward and outward pointing bulbs due to the singularities. Examples of Julia sets (a-c) show the dynamics. Note that the actual periodicities of the bulbs to the left and right differ although the parameter plane is symmetric because the winding involves realising inversions in one half but not the other, resulting in different 'spirograph' periodicities in the ascending periods. (10-12) illustrate the parameter planes and a Julia set of , showing rational transcendental functions. (13) shows the parameter plane and Julia sets of f(z)=ccos(z1/2). Half-integer powers work seamlessly for the cosine function because it has only even powers of z. The parameter plane and Julia sets of are also shown in fig 10. (14) shows the logarithm f(z)=clog(z) which fractally splits the complex plane, as do non-integer powers of z. Dark Heart contains a series of further examples to explore various issues with transcendental functions. For example attempts to produce other kinds of critical points than those of fig 4 appear to fail because Fourier transforms, such as those producing square or triangular waves in the limit converge to a real function on the x-axis. Also included are log function examples, which are not defined on the complex plane, but on a Riemann surface, requiring the plane to be cut in a way which results in fractal spits in the Mandelbrot and Julia sets. A complex function implementation of the Collatz 3n+1 problem is included. We now turn to the most challenging functions of all, those defined by Dirichlet series, requiring analytic continuation using gamma functions and Mellin integral transforms to put together a complete picture. I have designed Riemann Zeta viewer to specialize in these functions, including Riemann zeta, and the related eta, xi and Dirichlet and other L-functions, running right to the limits of current analytical number theoury research. This runs in the same way as Dark Heart but with some additionally focused controls. The archetypal and most famous example is the Riemann zeta function shown in fig 9 - 1(a). This has a single infinity at x = 1 due to the harmonic series , multiple (trivial) zeros along the negative x-axis due to the analytic continuation, and a string of irregularly placed (non-trivial) zeros forming a kind of Fourier transform of the primes along the critical line x=1/2. The Riemann zeta function is formally defined as either a sum over negative powers of the integers or an Euler product over the primes . But neither definition is convergent to the left of 1, but can be analytically continued to the entire complex plane, using the gamma function - a generalization of n! =n(n-1)�3.2.1 - to derive the functional equation expressing values for z < 0 in terms of those for z > 1. This would enable us to produce a portrait were it not for the fact that in the critical strip 0 < z < 1 the function is still divergent, so we have to resort to a trick, which is to use the fact that the Euler eta function converges for z > 0 because it is an alternating series and can be used to represent zeta. So for zeta, we use eta to get zeta for z > 1/2 and use the functional equation to get 1 – z . i.e. z < 1/2. 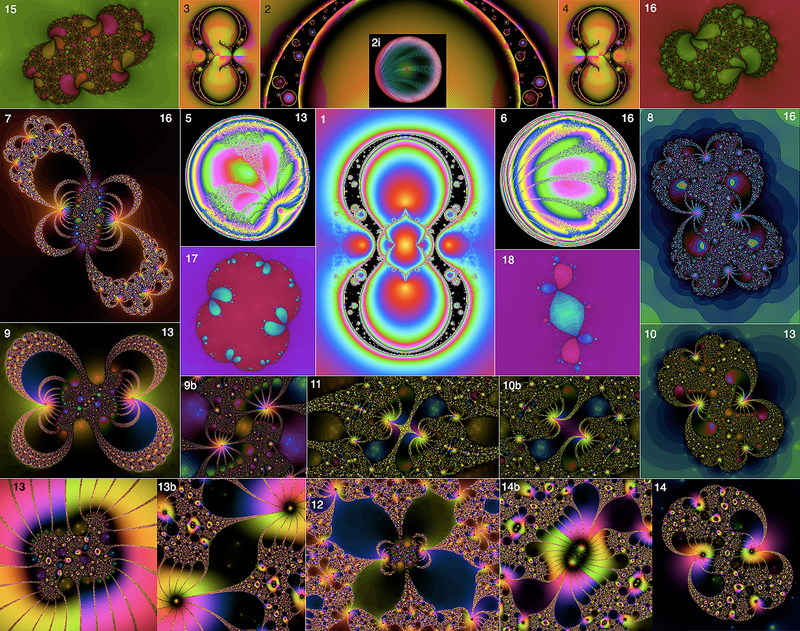 Fig 9: Sample illustrations of parameter planes and Julia sets of the Riemann zeta function. In fig 9 1(a) is the zeta function showing trivial x-axis zeros, non-trivial on x = 1/2 zeros and the red infinity at z = 1. In (b) is the derivative of zeta showing the critical points. (c) shows the additive parameter plane for the critical plateau z ~ 1000 showing sample Julia sets with the periods illustrated filling the right half plane. In (d) is the multiplicative parameter plane is portrayed. The four illustrations in (2) show the dark heart at the end of the central valley for the critical point z = -17.3 along with a sample period 3 Julia set, (3) the central basin with quadratic bulbs of critical z = -15.33 and obvious cubic interference similar to fig 5. (4) Details of the basin of the non-trivial critical point around z = 1/2 + 95i exploring a satellite dark heart and an associated period 3 Julia set, and (5) a dark heart in the singularity island for the critical point z = -13.29. The images in fig 9 provide an introductory view of the immense complexity of the fractal geography of Riemann zeta, whose parameter planes and Julia sets involve an infinite number of trivial and non-trivial criticial points whose critical values lie all over the spectrum and whose localities are as varied as we can possibly find. The Julia sets are dynamically responding to the dynamics of all the critical point, so are as complex in their dynamics as the infinite collection of parameter planes. The geography of the multiplicative zeta function is in many ways even more intriguing as shown in fig 9b. Fig 9b: The multiplicative parameter planes of the zeta function have many more surprises: (a) As we move through the negative real criticals, the global parameter plane goes through tectonic shifts in which the ocean in the right half plane becomes drained with new landscapes emerging. (b) The first negative real criticals near -2 to -13 have miniscule critical values, resulting in huge Mandelbrot sets from the large c values involved. (c, d) They also generate fractal Mandelbrots in the island generated by the singularity at z = 1, and in (e) we find more in the central basin. (f) The succeeding negative criticals from -17 on have vast critical values giving Mandelbrot satellites pinched in the vast coastline. (g) The boundary case -15 has a string of ‘jewels’ in the crown of the central basin (1, 3). Finally the unreal criticals neighbouring the critical line zeros, each have their own well-defined Mandelbrot satellites. The situation is even more complicated for other zeta and L-functions , which may have higher degree Euler products and multiple gamma factors and no eta function to smooth the critical strip, but here a Mellin integral transform can be used in the central region. A full set for more diverse functional equations used is included with the RZ flight manual. Riemann Zeta Viewer can portray virtually any zeta or L-function which can be represented by analytic continuation via gamma factors and Mellin transforms, including those of number fields, elliptic curves, and modular and Maas wave froms on hyperbolic spaces. Parameter files for all the known examples are included with the package. The RZ flight manual illustrates the use of a third degree Maass L-function to generate Mandelbrot and Julia sets. Dark Heart allows you to interactively explore the fractal dynamics of a wide variety of complex polynomial, rational and transcendental functions. See http://dhushara.com/DarkHeart/ for research, updates and source code. DHViewer is a matched pair application with the Riemann Zeta Function Viewer, RZViewer, which explores the corresponding L-functions based on Dirichlet series rather than power series. Drag a rectangle to enlarge a portion of the current image. *c at the clicked point on the Mandelbrot set. With keep scope on Julia view will take you back to the previous Mandelbrot screen to save computation time and enable you to explore several related Julia sets in the region. It will also retain scope on a reset to function mode. To return to full screen unclick keep scope and reset twice. By clicking, you can investigate the discrete dynamical parameter plane (Mandelbrot set) of the critical values and the Julia sets of z=f(z,k,c) for (x,y)=c, with k an additional parameter associated with the power. The additional parameter k can be set to a value other than k=2 by using Set R, I in function mode. It generally sets the exponent but for Sin(z)/z it sets the number of critical points. For cCos(z^k), Cos(z^k)+c, one can set half-integer values such as k=0.5 to get inverse quadratic cosines. The controls all have floating help panes to guide you. The window can be resized to suit in real time, resulting in a refresh and recalculation, or set to full screen using the green button. Esc to return to windowed mode. Threads enables a multi-core machine to work faster using as many threads as coprocessors. Max Iterations gives how many iteration steps of a point on the Julia or Mandelbrot set before maximum iteration cutoff. Recalc refreshes and recalculates the existing screen. Reset returns to the function and default scale but doesn't alter any other settings. Keep scope on click keeps the window centre and scale when clicking between Mandelbrot, Julia and function, so the other parameters can be changed without changing the point of view. About gives a complete instruction summary. Save saves the current window's image as a tif file and all the settings for a given calculation in a text file (see format below), enabling you to save all the parameters for future investigation and redrawing. It will overwrite any files of the same name. Load Parameters will load a previous calculation and redraw it. Load Movie Seq loads a sequence text file to generate a series of images to make a movie (see format below). Save Movie saves the sequence as a series of LZW compressed tifs, which can then easily be composited into a movie e.g. using open image sequence in Quicktime Player 7 (https://support.apple.com/kb/dl923?locale=en_US), or using the included app Mpeg Streamclip. Print enables an image to be printed or exported to pdf format. Page Setup needs to be landscape in 80% to fit the standard window on one A4 page. Help directs you to the about menu. Pop-up Menus: Color schemes can be changed in real time using the color pop up menu. All the other controls require window recalculation. A Variety of Functions as discussed above can be explored using the function pop-up menu. The escape bound can be set but resets on function change to the one most appropriate for the given function. The escape type is usually a (absolute) for polynomials and rational functions and r (real) for exponential and i (imaginary) for trigonometric functions. Setting r+ for real positive enables fine depiction of exponential Cantor bouquets, and i+ for cos and sin bouquets. Buttons and Text Fields: Current window parameters and c values can be read out from and written into the text fields and set by pressing the appropriate button. Numbers in the text fields are double precision and may appear in floating format e.g. -7.000000186963007e-05 manifestly too large to see in their entirety in the text box without dragging or selecting all and copying. The Julia c values will be overwritten by the Mandelbrot critical point origin and current Julia click point each cycle but can be manually re-entered as desired. You can use dF as a computation of the derivative of the function to locate critical points as its zeros and then when you click twice and carry it to Julia with this c value, checking hold will keep it in the real and imag fields so you can click SET R,I to get the Mandelbrot set to have the correct critical point. While dF is on, you will only get the chosen Mandelbrot set of one critical point rather than all superimposed. This enables you to explore individual Mandelbrot sets of each critical point by inserting it in c.
Tick boxes: There is an imaginary axis orbit trap option. Escape only tests only for escaping points. When turned off the routine also checks for attractors up to period 18, coloring internal basins, but this can also flood surrounding regions if the attractor bound is set too high for the region being investigated. When color mode is 1 instead orbit trap doubles the period search to 35 and enables adjustment of black and white shading of Siegel discs and related parabolic sets. Sliders: Attractor bound adjusts the size of the epsilon neighbourhood testing for fixed point or periodic attractors. Escape bound sets the numerical bounds on points escaping to infinity. Function: (0,4) rgb = logarithmic abs(z), blue cosine abs(z), green ang(z). (1) rgb = real, imaginary and angle, (2) bg = abs(z) and angle (3) rgb = real, imaginary and cos(angle). Mandelbrot: (0) Sine wave colours (1) Period-coded colours that show the periodicities inside the dark hearts when Escape only is off. The escape bound slider can then be used to adjust colour shading, or to adjust velocity coded cosine in b&w for non-periodic rotations when orbit trap is selected. The attractor slider also affects hading in both cases. (2) RGB ranked colours which can also show which attracting fixed point is involved in Newton's method for k=3 and the Herman ring (3) Attractor-coded rainbow which highlights individual attractors in rational mappings, including Newton's method, by the angle, which also shows the mapping on individual sub-regions of Julia sets in terms of a rainbow in p steps where p is the period. (4) Same as (0) but with square root behavior. Very good for highlighting boundaries and complex dynamics. (5) KBCGYRM colour rotation with W. It also portrays the velocity coded cosine in b&w for non-periodic rotations with Escape only off and orbit trap is set. You can adjust the effect for different rotation rates using the escape radius slider. (6,7) Further colour schemes also used with moduli spaces. Period coding in mode 1 gives escaping points tending to real infinity shades of grey from white to black in waves by iteration number in the same way as mode 4, giving clean exteriors, with periodicities coloured approximately by the following 1 2 3 4 5 6 7 8 9 10 11 12 13 14 15 16 17 18 mildly shaded by iteration number. You need to turn off escape only and set the attractor bound e.g to 10^-2 (default). When orbit trap is set in Mandelbrot mode, it doubles the period search to 35 colouring the higher values in lighter shades mod 18, but this will also slow the computation. In Julia mode periods always go up to 35. With orbit trap off you can adjust the escape bound slider to get the right degree of color-coded shading. For periods up to 18, this shades to black but for higher periods with lighter shades, the base colour varies. With orbit trap on both views portray the velocity coded cosine in b&w for non-periodic neutral rotations, as in mode 5 and gives an average colour coded view for periodic sets. Attractor coded colours in modes 2 and particularly 3 can distinguish each basin by color in periodic Julia sets and when there are several attractors, such as in the Newton's method iteration. Occasionally e.g. when you set the c values of a Julia set to 0 this may give a Moire pattern anomaly, due to undeflows of the angle, which you can suppress by choosing a neighbouring non-0 point e.g. 0.01. Julia: (0) Sine wave colours, (1) attractor coded colours as above, (2) RGB ranked colours, (3) rainbow with potential function on escaping points. (4) As 0 but with square root behavior. Very good for highlighting boundaries and complex dynamics. For example the classic quadratic Seahorse Valley Julia c = -.74543 + .11301i. (5) KBCGYRM colour rotation with W as above. You can investigate a variety of functions,  z^k+c,  cz^m(1-z)^n,  z^m-nz+c,  (z^m-n)(z+c),  Int(z^m-n)(z+c),  z^k+(c-1)z-c,  Newton's method on the previous function i.e. ((k-1)z^k+c)/(kz^(k-1)+c-1),  cSin(1/z),  cCos(z^m)^n,  Cos(z^k)+c,  c(Sin(z)+Sin(2z)/2),  c(Cos(z)+Cos(2z),  cSin(z)/z,  c(z^m)e^(z^n),  (z^k)e^z+c,  Transcendental (see list below),  Rational (see list below),  z^m-10qz^-p n=p.q  cz^(z+k),  c(z^3+(k-1)z^2-kz),  e^(-z^k)+c,  Quintic, [23, 24] Herman ring function,  generalized Collatz iteration,  z^m+cz^-n k=m+in  cCos(z^m+z^-n),  Milnor rational examples ,  z^m-10qz^-p n=p.q. z^3-(m+in)z  Mating. Here is a function number list mapping to the app menu. Some of the transcendental functions are comparable with the gamma and zeta functions in Riemann Zeta Viewer. All but a few of the functions are unique valued on the complex plane. Although cCos(z^(1/2)) has no branch cuts, all those implicitly involving log(z), including czLog(z), and cz^(z+k), do. The function z^m-nz+c, can be used to explore variations of the parameter planes as we move from z^m+c by increasingly separating the critical points. n can be either positive or negative, giving real or imaginary critical points in the cases of z^3 � z. The functions z^m-10qz^-p n=p.q and z^m-10qz^-p n=p.q (listed at the end) are accessed by inputting k=[m,p.q] e.g. for z^3-2z^-1 we input k = [3, 1.2]. You can also input negative values for p e.g. to get z^3-z^4 we input k = [3, -4.1]. Some functions might look more interesting with small values of q which bring the parameter planes into intersection. You can input positive or negative values for k into (z^k)e^z+c. The value n=0 has only the exponential plateau at x=-1000 as critical and n=1 has this and the other critical at x=-1 as criticals so you can see the effect of both together in mode 1. To turn off and see the Mandebrot bulbs select dF to get only x=-1 critical. 11 -log(cos(z)*c whose derivative tan(z) has both zero and infinite criticals. 13 (z-tan(z)+((tan(z))^3)/3)*c whose derivative (tan(z))^4 has both zero and infinite criticals. Asymmetric and symmetric Julia reps.
11 4, Per4(0) z=(z-c)(z-(2c-1)/(c-1))/z/z, Asymmetric. 11 4.5, 4.75 z=(z*z+((c-1)±sqrt(5*c*c-6*c+5))/2)*(1-c*c)-1)/(z*z-c*c) Double plane symmetric Julia reps.
by turning on hold after the first and pressing Set R,I after each click to retain the original location. Parameter files for Per1(0), PrePer(1,1) are included in the quintics folder. 22 c^2(2c-3)/(3-3c)*(z*z*z-z*z)+1/c Critical 0 -> 1/c -> crit 2/3. The quintic folder also contains cz^2[z-1]+2|3 where crit 0 -> crit 2/3. 23 c(z+0.5/z^2) Similar to Newton's example with rotational symmetry. There is a similar example Mandel1 in Milnor. Both use mode 3 to effect. Matings are rational function Julia sets which have complementary components consisting of two types of quadratic Julia set fractally intertwined. The above rational examples Perk(0) define parameter planes of quadratic rational functions with the critical point having a fixed period but the other one free. The Julia sets of these exemplify matings of the root Julia set of periodicity k with the spectrum of Julia sets defined by the other critical point’s c values in the parameter plane. A broad palette of precompiled Medusa mating parameter files are included in the matings folder which upload to the Mating function f(z)=(az^2+1-a)/ (bz^2+1-b) where a and b are input as coefficients in the file. These allow one to use the Medusa algorithm to define the rational function mating the Julia sets having two fractional external angles p/q and r/s. Medusa is included with Dark Heart, with source code, as a command line tool which can be run from Mac Terminal by typing “./mating”. The final output of this once convergence is reached can be portrayed in Dark Heart by entering them into the c-script mating.c, or pasting the coefficients into one of the example parameter files. Medusa is consistent with the symmetric representations of Perk(0). If you don't have Apple's XCode installed you will need to download it, free from the Apple Store and then install the Terminal command line tools by executing xcode-select --install in Terminal to activate gcc. On older systems, a suitable version of XCode can be downloaded by signing on for a free Apple Developer account. The script can also be edited, compiled and run in XCode as a command line tool . By saving and adjusting the coefficients and powers of c in the test file, and reloading, you can portray parameter planes and Julia sets of any polynomial up to degree 5. The application will automatically find the critical points up to degree five. The application comes preprogrammed with a sample quintic f(x)=x^5-3.25cx^3+2.25x+c to illustrate how to program different parameter planes. This will be overwritten on loading a saved parameter file. You can use this to replicate several parametrizations e.g. z^4+(c-1)z-c can be cloned as z^4-sz-1+s, s=1-c. See parameter file contents below for details. Newton's method on the k-th roots of unity shows how seeking for the roots of a function by iteration can leave behind a chaotic boundary set where the iteration can’t reach the attracting roots. To see the standard Julia set of the roots of unity, insert the value (0,1) into Julia mode, since c = 1 gives z^k+(c-1)z-c = z^k-1. If this is run in attractor coded modes 3 (or 2) the basins are individually colour coded. For k = 3 in RZ 2.0.6 you can set the imaginary part to -1 to get the repelling version. Higher powers don't work here because the forward Newton’s method has critical points determined by z=0 and the c-displaced roots of unity, since the derivative of g(z)=z-f(z)/f '(z) is g'(z)=f(z)f ''(z)/(f '(z))^2, and the super-attracting displaced roots have infinite parameter planes and can be ignored, but the inverse repelling process gives g'(z)=2- f(z)f ''(z)/(f '(z))^2, whose 2k-2 degree equation can be solved only for k ≤ 3. This dynamic is almost entirely repelling except for Julia kernels determined by the small isolated Mandelbrot islands. The Herman ring in cz^2(z-4)/(4z-1) is a famous special rational function case with an irrational annular flow for Julia sets for which c= exp(i*g*pi/2) = 0.564635 + 0.825341i, or c= exp(i*g*pi)= -0.3624 + 0.9320i where g = (5^(1/2)-1)/2 the Golden Mean. Choose colour mode 5 and have escape only turned off and input the precise numbers into Set R/I and you can see the rotation pictured in cosine of the velocity. You can adjust the effect for different rotation rates using the escape bound slider. You can view the Herman ring system in two configurations, making Mandelbrot sets for each of the two parametrizations cz^2(z-k)/(1-kz) and kz^2(z-c)/(1-cz). If you switch from the second function to the first just before clicking a point in Mandelbrot mode it will retain Mandelbrot mode, save c as k, and allow you to input the second parameter c by clicking. You can see the k=m,n values in Set R, I in function view. A further click takes you to the k, c Julia set. Similarly to the Herman ring, the standard quadratic function z^2+c has Julia sets with irrational flows on Siegel discs between all the fractal bulbs on its boundary for example at c = -0.390541-0.586788i , which is a solution of the cardioid c=exp(ig2pi)/2-exp(ig4pi)/4 for g = (5^(1/2)-1)/2. You can contrast this with the period 3 parabolic petals on the boundary of the cardioid c=-0.125000-0.649519i which clearly shows it is in transition between period 1 and 3 at 1024 in mode 1. The 20 leaf parabolic Julia set c = .27334 + .00742i shows its leaves on mode 5 with escape bound 10^3 at 4096 iterations. A series of C-script examples of rational parameter planes are also provided under the Milnor function option which explores the iterations z > 1/c(z+r.c+s+1/z) and its dual z > r/(c-s)(z+c+s +1/z). One can use z^m-nz+c, and (z^m-n)(z+c) in modes 3, 6 or 7 with orbit trap selected to explore moduli spaces of these Mandelbrot sets, as they have dihedral symmetries. Two c-values c1 and c2 of such functions are conjugate under a Mobius transformation f(z)=(az+b)/(cz+d) if and only if c2=w*c1 with w an p-th root of 1 (p=m-1 in the former case) where the symmetry is by an p-th of a revolution. Hence we can take equivalence classes of such c to form a new complex plane C=c^(1/p), displaying each equivalence class and its conjugate, which fully classifies the resulting Julia sets up to rotations by 2*pi/p. One can also use z^m-nz+c,to explore the Mandelbar equivalents conj(z)^k-nz+c , by inputting k=(m+100,n) for m a positive integer ≥ 2. The classic Mandelbar is conj(z)^2+c , which you will get by setting k=(102,0). However here the moduli spaces option gives C=c^(1/(m+1)) for n=0 but for n≠0 the Mandelbrot set now only has symmetry by x and y reflection, so we have to assert a reduced symmetry equivalence class. and shows why although all positive integers in the 3n+1 problem eventually end up in the 3-cycle 4>2>1 for complex values we have fractal chaos. Set k using function view and then c using Julia view. (k,c) = (1,3) and (2,3) give the standard and reduced Collatz sequences as above. You can also set 5n+1 and 7n+1, which give both periodic and chaotic escape to infinity for given values. You can use color mode 1 to check the periods of the Collatz (3n+1 n odd n/2 n even) iteration. Set up the Julia iteration as above, and set color 1 with escape only off and attractor bound 10^-2 (default) with Max iterations set to 1024. Then set RIS for (x=n,y=0) and use scale to zoom in. For positive integers you get period (3), for -1 (2), -5 (5) and -17 (18). You can also check 5n+1 e.g. 4, 6 give period (7), 5 gives (10), 7, 9 give (chaos) and -4 gives (3). 7n+1 gives either period (4) or (chaos). The function z^m+cz^-n gives symmetrical Mandelbrot sets with unique Julia sets of three types, Cantor set (Fatou dust) of points, Cantor rings (simple closed curves) and Sierpinski curves (fractal Swiss cheese). The function and Julia sets have m+n-fold rotational symmetry while the Mandelbrot set has (n-1)-fold symmetry, despite there being n+m free critical points. The final function is the zeta function of the Petersen graph, a degree-24 polynomial with multiple critical values, giving high order Julia sets. The parametrizations of both cPetersen and Petersen+c are given for comparison (k=0 inverse +c k=1 inverse *c k=2 original +c k=3 original *c ). You need to have escape only turned off for the last two. You can investigate the Rieman Zeta function and a variety of other zeta and L-functions using Riemann Zeta Viewer which is designed to deal with these advanced functions. Parameters Text file format:  mandel (2=function, 1= Mandelbrot, 0=Julia), [1-5] Scale, X, Y, (Fn k J/M c) R, I,  the current function,  escape type (abs real or imag),  orbit trap (0/1) + 2*dF + 4*mval (0=use std crits / 1=use input crit),  escape only (0 or 1),  color scheme (0 to 3),  escape bound (exponent 10^n),  attractor radius epsilon bound (negative exponent 10^n),  maximum iterations, [14-15] real and imaginary values of k,  previous function  dummy 987.654321 so you can find >> [18-29] complex coefficients a + bi of a polynomial up to degree 5 (6 pairs of reals), [30-35] powers of c (usually 0 or 1) multiplied into each coefficient of the polynomial for the Mandelbrot plane. Additive c.
Two C-scripts are provided to explore polynomials. The C-script crits.c will generate any polynomial up to degree 5 from its critical points, scaling and rotating these together as required, enabling one to generate examples with arbitrary criticals in a given position. The script coefs.c provides an easy way of setting up an arbitrary polynomial up to degree 5 from its coefficients and parameter plane c values. See additional software for scripts below. A series of rational function parameter plane examples are also provided which use an amended polynomial coefficient format to explore the Milnor function option. Movie Sequence Formats: The text file consists of series of floating point numbers. (1) File format 1-3 (2) N<=1000 number of frames (3) 1/0 Mandelbrot/Julia followed by a sequence of frame parameters [ X, Y, Scale CX, CY]. Format 1: only the start and end parameters are specified and DHViewer will generate N frames in a linear sequence between these values. Format 2: the file supplies a series of N parameters on any trajectory, for instance computed values running around the cardioid of a Mandelbrot set. Format 1 and 2 files can either generate blowups of Mandelbrot sets or movies of Julia sets as CX and CY vary. The sequence file has no parameters except mandel, so you can set all the other settings manually before saving the movie. If you want to determine in advance the complete parameters for a movie run, save your parameters and load them before loading the movie sequence file. Format 3: The format file contains only parameters 1 & 2 and is accompanied by a series of full parameter files, generated by another application such as the C-scripts attached which can be run from Terminal. If the format file is myfile.txt, the parameter files need to be numbered myfile0.txt - myfileN,txt. This format enables batch programming of any sequence of images automatically. The file moduli8.c illustrates an extreme geometric scaling blowup using scientific notation fprintf("%e") rather than the 6 decimal point precision of fprintf("%f"), which can be used in any of the other c-scripts as well. You can also use geometric, or linear scaling: apos=xstt*pow((xend/xstt),((double)k/((double)frames-1))); (geom) apos=xstt+(xend-xstt)*k/(frames-1); (linear). Ultra-large images: The file 'large.c' in the rational folder enables the generation of very large Julia and Mandelbrot images suitable for poster size displays. The script can be adjusted to generate a set of tiles in the standard window size of 750x513 using a set of image parameters you have saved as a parameter file. A file 'page.png' is also included in the folder, which forms a white background 7500x5130, which can be opened in Preview. You can then paste each of the tiles into the large page to get an expanded size image, by choosing actual size and pasting and lining them up carefully. An app to do this automatically is in development..
A series of movie scripts to generate the movies of the cubic separations is included with a manual of how it was created to give an example of using Dark Heart to generate trajectory variations in the field of view as satellite Mandelbrots or Julia parameters change in non-linear ways. The file moduli8.c illustrates an extreme geometric scaling blowup using scientific notation fprintf("%e") rather than the 6 decimal point precision of fprintf("%f"), which can be used in any of the other c-scripts as well. (c) Save Movie to an empty folder get a 500 frame Julia movie sequence. 4. Four template movie sequence files are included in movie C-scripts. You can run the sample files from Terminal as shown in each file header. This is a fully programmable interface which provides a template for much more powerful movie making. Fig 11: Rieman Zeta Viewer controls portraying a degree-3 Maass form L-function. a host of its Dirichlet L-function variants and their transformations and those of a diverse spectrum of abstract zeta and L-functions as well, right to the cutting edge of mathematical science. RZ operates in the same way as Dark Heart viewer, but has some additional controls, so we will go through the manual from scratch for completeness. By clicking, you can investigate the Mandelbrot set of these functions for a variety of critical values, and the Julia sets of z=f(z)+c (or z=cf(z)) for (x,y)=c. You can also investigate related functions eta, xi, the derivatives of each function and Newton's method (see below). By uploading the provided parameter files you can also investigate abstract L-functions of elliptic curves, extension fields and modular forms and/or generate movies of the dynamics. at the clicked point c on the Mandelbrot set. Clicking the Julia with keep scope on will take you back to the previous Mandelbrot screen to save computation time and enable you to explore several related Julia sets. Threads enables a ual, or multi-core machine to work faster using as many threads as coprocessors. Max Iterations gives how many iteration steps of a point on the Julia or Mandelbrot set before maximum iteration cutoff. Recalc refreshes and recalculates the existing screen. Reset returns to function view. Keep scope keeps the window centre and scale when clicking between Mandelbrot, Julia and function, so the other parameters can be changed without changing the point of view. A double Reset with keep scope off returns to the default scale on the second click. To Reset to other functions after loading an abstract L-function, you will first need to renter a suitable L(m,n) such as (1,1) for zeta, as the value of m has been set to 0 to override these settings with the loaded coefficients. To facilitate locating critical points for calculating Mandelbrot sets, tick dZ and explore the derivative function for a critical point (a zero of the derivative looking like a dimple). Use dragging to blow up to high resolution. Tick Keep scope and slowly click twice right on the zero without moving the mouse. The c-values will now appear in the Julia portrait. Then tick Hold, untick dZ and click twice through the original function to the Mandelbrot set. The c-values are retained in the text field by Hold. Now untick Hold and click the Set R,I button and you will get the Mandelbrot sets of the given c-value. To facilitate fast fractal iteration, the default is 100 function series terms and a cutoff of 64 iterations for each point of the Mandelbrot and Julia sets, but these can be adjusted for greater accuracy. About gives a complete instruction summary. Save saves the current window's image as a tif file and all the settings for a given calculation in a text file (see format below), enabling you to save all the parameters for future investigation and redrawing. It will overwrite any files of the same name. Load Parameters will load a previous calculation and redraw it. Load Movie Seq loads a sequence text file to generate a series of images to make a movie (see format below). Load Bitmap loads a bitmap of values of a function generated by another application. Computel and Sage scripts are included (see below). Save Movie saves the sequence as a series of LZW compressed tifs, which can then easily be composited into a movie e.g. using open image sequence in Quicktime Player 7 (Download: https://support.apple.com/kb/dl923?locale=en_US), or using the included app Mpeg Streamclip. Save Bitmap saves a bitmap of complex function values for subsequent math processing if the image has previously been refreshed in colour scheme 5, which also produces a useable bitmap in its tif files. This is to keep the other colour modes as fast as possible. The bitmap saves the values of the function, so doesn't care about the colour scheme. Print enables an image to be printed or exported to pdf format. Page Setup needs to be landscape in 80% to fit the standard window on one A4 page. Help directs you to the about menu. Functions related to zeta, including eta, xi, gamma, psi and others discussed below can also be explored using the function pop-up menu. For completeness, an alternative Gamma product formula, can be used instead of the default Lancos approximation, by pulling down the pop-up menu to choose a power of 10 terms in the product, but is slower and less accurate unless 10,000 iterations are used. Buttons and Text Fields: A function terms text field is provided to set how many terms are calculated in the chosen sum or product function, with a default of 100 for speed of initial exploration. This can be adjusted to exact large values which have anomalous behavior (see end). Current window parameters and c values can be read out from and written into the text fields and set by pressing the appropriate button. L(m,n) text fields enable examining a wide variety of Dirichlet L-functions as well as Zeta and Eta. Numbers in the real text fields are double precision and may appear in floating format e.g. -7.000000186963007e-05 manifestly too large to see in their entirety in the text box without dragging or selecting all and copying. The Julia c values will be overwritten by the Mandelbrot critical point origin and current Julia click point each cycle but can be manually re-entered as desired. Tick boxes: dZ finds the approximate formal derivative of any function being displayed. Good for finding critical points since these are the zeros of the derivative. It works only in function mode. For fractals use dZeta or dXi. You cand get the second derivative approxiation by combining the two. Full Terms is located on the pain page as a control and as an attribute. It forces the current function to use all the specified series terms. Otherwise it breaks off if the terms get smaller than 0.001 the size of the sum. Occasionally not having Full causes strip dislocations in a few regions. The control has immediate effect during drawing and is useful if a slow blow up of a Julia set needs to have full iterations just for the complex boundaries of the kernel. Mellin uses a Mellin transform in the central region if the function admits an analytic continuation. Like Full Terms, it is active during drawing. The logFn. tick box examines the log of the selected function. Split sets the functional equation split (-1 > -100, 0>0, 1>0.25, 2>0.5). Xi calculates the xi function instead of zeta/L. R- escape makes the escape path negative only highlighting the Cantor bouquet structure. Mobius transforms the complex plane, mapping the line x=1/2 onto the unit circle, so you can see the whole extent of the Dirichlet functions. For the exact mapping see below. Escape only tests only for escaping points, to avoid spurious periodic solutions from overwriting escaping orbits, but is slower because attracting orbits have to run to the Max interations for each point. The application defaults to this being off and colours most modes so escape to the right is colored the same as non-escape speeding the calculations, but to get high resolution images of small Mandelbrot and Julia kernels you may need to turn it on. crVal uses critical value instead of critical point for Mandelbrots. This is useful for generating parametric movies running between critical values. See blue skies method below for finding critical values. The tick box +c/xc changes the parametrization from f(z)+c to cf(z) giving a second parameter plane and collection of Julia sets for each function. Angle turns on and off the green/yellow display of the angle (argument) of f(z) in function view for each mode. Rotate rotates the image by pi/2 to assist viewing the critical line. Sliders: Attractor bound adjusts the size of the epsilon neighbourhood testing for fixed point or periodic attractors. Escape bound sets the real absolute bounds on points escaping to infinity. Function: (0) Absolute-Angle mode rgb = red logarithmic abs(z), blue cosine abs(z), green angle(z). This is the most informative although not the most appealing (1) Real-Imaginary mode rgb = real, imaginary and angle, (2) X-ray mode with red, cyan real~0 and imag~0, by exp(-x^2), adjustable by the attractor bound, overlaying bg = abs(z) and angle(z) Highlights gram points with real=0 on x=1/2 and zeros at the intersections of real~0 and imag~0. (3) Positive-Negative mode. Highlights the positive and negative real (r~c), imaginary (g~m) and angle by 1-cos (b~y). (4) Log-angle mode This method uses abs(log(1/(1-Z(z))) for the absolute value, adjustable using the escape bound slider, retaining the angle of Z(z). This still highlights the zeros since log(1/(1-0))=log(1)=0 but highlights variations in the function to the right of the critical line. It is good at highlighting the function in the right half-plane and in the crtical strip in a way which evenly compares asymptotically large and near-unitary values. (5) Soft mode rgb = cos(angle) sin(angle), abs(z). Good for retrieving function data fromthe tif file. Mandelbrot: (0,5) Sine wave colours, (1) Attactor coded colours, giving escaping points tending to real infinity shades of grey from white to black in waves by iteration number with periodicities coloured approximately by the following 1 2 3 4 5 6 7 8 9 10 11 12 13 14 15 16 17 18 mildly shaded by iteration number. You need to turn off escape only and set the attractor bound to 10^-2 (default). (2) RGB ranked colours (3) Potential function rainbow. (4) attractor coded inverse quadratic. (Highlights geometrical details lost in high iteration numbers). (5) Attractor coding giving escaping points tending to real infinity green through orange and points remaining finite coloured by decreasing blue by iteration, combined with redness corresponding to the attractor period. When R- escape is set in mode 1 it doubles the period search to 35 colouring the higher values in lighter shades mod 18, but this will also slow the computation. The 'critical' point for the Mandelbrot set is chosen to represent a prominent critical landmark. For zeta, eta, mu, and sigma it is chosen to be 1000 corresponding to the limit f(z)>1 as real(z)>+�. For gamma it is 1.465. For Xi it is 0+ki, k=0.00000001~0. Other critical points can be chosen using the advanced settings and inputing CX CY values under Mandelbrot mode, just as c values can be inserted for any Julia set. A list of critical points for zeta eta and xi is provided below, or can be approximated using the values of observed zeros of dzeta etc. You can also input CX and CY in function mode to generate a transform of the function, whose zeros are at the fixed points of the critical values [f(cv)-v=0 or f(c+v)-v=0] and hence candidates for being in Mandelbrot kernels of the critical points. You can flip easily between Mandelbrot mode and transformed function mode using 'keep scope on click'. To exit reset. This can potentially find a finite number, out of the infinite collection of kernels, but sometimes the one located is vanishingly small, leading to blowing the mantissa of the floationg point doubles before we reach it. Not all the functions have meaningful Mandelbrot sets. The zeta attracting fixed point is at -0.2959050055752. Julia: (0) Sine wave colours, (1) Attractor coded colours, (2) RGB ranked colours, (3) Rainbow with potential function on escaping points. Colour coded Julia attractors have blue shaded to escaping real, red shaded to periodic attractor, green non-negative periodic attractor, with grey indeterminate. The red and green are tinged with blue to indicate the period. (4) Attractor coded inverse quadratic. (5) Attractor coded with RGB mapping. For exploring the higher zeros of zeta, a high number of series terms can be set using the slider. Values of the RZ function outside the critical strip [0,1] are set to 0 after y=�450i because the sin/cos component of the analytic continuation overflows to Inf. This leaves the zeros in the critical strip still well rendered up to values in the millions with the highest number of zeta iterations set in the slider. The package is designed to facilitate research into the widest spectrum of zeta-related and L-functions possible. Each of zeta, eta and all the L-function variants L(m,n) for m up to 63 are encoded as a generalized zeta function which can then be differentiated, or have any of the functions from xi, through those like lambda and mu whose coefficients are important arithmetic functions, to the Newtons method's and differentiation applied to them. This creates a widest a diversity of exploratory functions as possible. Used to extend Zeta from real(z)>=1 down to real(z)>=0. To access it set L(m,n)=(1,-1). where X(p,q) is the qth set of Dirichlet characters of period p.
Enter p=Xm and q=Xn into the L(p,q) text field. Each of the other variant zeta functions can be applied to any of the L-functions as well as zeta and eta. The viewer calculates the finite residue groups Z/Zn generating the characters, factors both for sub-periodicities and for conductors, and then applies the correct functional equation and prime multiplicative factors to give the full representation on the complex plane. A Mellin transfor is performed in the central basin to improve fidelity. A Terminal C-script is included with the application files which shows how a given character cast X(m,n) is generated and reduced to its primitive form. If you don't have Apple's XCode installed you will need to download it, free from the Apple Store and then install the Terminal command line tools by executing xcode-select --install in Terminal to activate gcc. On older systems, a suitable version of XCode can be downloaded by signing on for a free Apple Developer account. The script can also be edited, compiled and run in XCode as a command line tool.. Examples such as those of elliptic curves, number fields and modular forms can be uploaded by including their coefficients and functional equation parameters in the appropriate file format and viewing as raw/abstract. A suite of preloadble cases is provided in the files along with the Terminal C-scripts which generated them and Computel PARI-GP and Sage scripts which generated the Dirichlet series coefficients. Some of the examples (particularly the field extensions) display convergence problems in their critical strip similar to naked Riemann zeta , requiring a Mellin transform treatment as is done for Dedekind/Hecke functions, but many of the elliptic curve and the modular form examples give quite accurate portraits. A working copy of PARI-Computel is included with RZViewer, so all the examples, except for the modular form coefficients, can be generated without use of Sage. Gamma G(z) the compex number extension of integer factorial n! with n=10^k terms if alt gamma is set to a non zero value. including abstract L-functions, by selecting in the Xi tickbox. The unction provides a symmetrical presentation of the zeros on x=1/2. equivalent singularity bearing Xi function of zeta for Xm=1 Xn=0. Note: Xi is rotated so the zeros are on the critical line, rather than the real axis. The following set of derived zeta functions all work also for any L-function. The M�bius function mu(n) = (-1)^k when n has k distinct prime factors of multiplicity 1, and 0 otherwise. The divisor function dvs(n)= Sum(d : d | n). The Mangoldt function Lam(n) = log(p), n=p^k and 0 otherwise. The Liouville function lam(n) = (-1)^om(n), om(n)=no. of prime factors of n counted with multiplicity. The totient function tot(n) = no.of positive integers k � n coprime to n.
dGamma, dXi and dZeta are the derivatives G'(z), X'(z) and Zt '(z) or any of the L-functions in zeta with xm and xn set. You can also perform an approximate formal derivative of any function at all using the dZ tick box to loo for critical points to source Mandelbrot sets, but this is active only in function mode. To see fractals of the derivative function use dZeta. You can also view the second derivative of a function, but not its fractals by combinining both. NewtonZ, RepellngNZ and NewtonX are the Newton's method functions for zeta, and xi. They are provided because they naturally relate to the zeros. Xct[p prime](1/(1-X(m,n)p-z)), which is technically defined only for real(z)>1, included for comparison with zeta the analytic continuation version above. Zetaterms adjusts the product terms in the same way as with zeta. where mu is the M�bius function (see above). It is included for completeness. It is defined only for real(z)>0. Enter l into Xm. Xn has no effect. These functions have a Mellin integral transform in the critical strip 0 < x < 1, for small y for |Xm | <10. abstract/raw zeta/L is a direct computation of Sum[1,�](X(m,n)/nz). zeta and L-functions, including those of elliptic curves and modular forms with varying functional equations and gamma factors. See the section on uploading parameter files and the installation file set for examples of each. which equals (5,1) at th=100 and (5,2) at th= -468. [-pi pi] = [-567 567]. As this function writes and reads DL information from memory, threads are set to 1. A gif file of the definitions of these functions is in the attached files. Hurwitz zeta functions H(z,a)=Sum[1,�](1/((n+a)z) generalize Riemann zeta. As this writes and reads DL information from memory, threads are set to 1. Power Series gives the power series P(z)=Sum[1,�](a(n)z^n) corresponding to the Dirichlet series L(z)=Sum[1,�](a(n)/n^z) either of character Xm, Xn or uploaded as a coefficient set (see below). Fourier does the Fourier series viz F(z)=Sum[1,�](a(n)exp(2pinz)) either of character Xm, Xn or uploaded as a coefficient set (see below). Both the two above functions are useful when examining modular forms which are expressed as Fourier series in the upper half-plane or as power series in the unit circle. By selectng Escape Only, you can set the areas where the functions are formally undefined to black. By also selecting R- escape, you add 1 to the result which enables loading an Eisenstein series leaving out its leading 1 in the same way as an L-function so that one can do a Fourier or Taylor portrait of all the components of a modular form space. 1/(k^z) and 1/(1-k^-z) etc. give sum and product component functions input by k=function terms. Weierstrass plots a Weierstrass modular function using the first two complex coefficients of any Dirichlet or loaded abstract L-function as periodic vectors w1 and w2 on a parallelogrammatic grid extending for 2*sqrt(fnterms) to illustrate what modular functions associated with elliptic curves look like. Facts(n)= number of unordered factorizations of n.
This gives an example of a function with a product that doesn't involve primes. It is included as a script file example with the application files. Theta and RSZ have been rotated so that the zeros are on the critical line rather than the real axis. The chequerboard effect is an artifact of the log when the gamma function rotates through the principle value as the imaginary part of z increases. A clearer view of RSZ is gained by turning off angle. Mobius transformation: M(z)=(a*z+b)/(c*z+d) k=40.0, a=k+1/2, b=1-a c=d=1; with inverse M'(z)=(d*z-b)/(-c*z+a). This takes -1 to infinity, 1 to 1/2 and i to 1/2+40i, thus wrapping the critical line around the unit circle. In our case the inverse transformation is M'(z)=(x+39.5)/(z+40.5), so 0.9753 = 39.5/40.5 maps correctly to 0 to give the Julia set of zeta. Parameters Text file format:  Mandel (=2 function =1 Mandelbrot =0 Julia), [1-5] Scale, X, Y, cr, ci,  altgamma (0 or 2-4),  the current function,  theoretical dzeta (0, 1, -1 2),  R- escape,  addtive or multiplicative c  escape only (0 or 1),  color scheme (0 to 3),  escape bound (10-100),  number of zeta terms,  attractor radius epsilon bound,  maximum iterations,  do log of fn  angle included in colour scheme  Mobius  cval (holds entered critical point),  old fn. real k  imag k  crval+2*Xi  full terms+2*dZ+4*Mellin  xm  xn  flip. Arbitary Dirichlet series: You can also add additional parameters to a saved text file or scripted movie file to define an arbitrary generalized Dirichlet series Sum[an]*[n+bn]^-z of up to 1024 terms. These are not saved, as they cannot be adjusted in the advanced settings. xm needs to be set to 0 and xn to 2 to cause the system not to override k and h.  character period length k,  chr. type h (2 or -999 or -998). Type 2 has k real and imaginary coefficients which can be varied in a movie script. Type -999 has both k coefficients a(n) and an additional k adjustments n+b(n) to the integers n forming the powers n^-z. In this way we can generate continuous movies which pass between L-functions, using non integer exponent bases. Type -998 is used to instead multiply the resulting function with integer coefficients by (1-2^(1-z))^-1 to convert an eta type series into its zeta form. Abstract L-functions: you can upload an abstract zeta/L function using the character period length k  with Dirichlet series coefficients as above with chr. type h = -997, appended after the k complex coefficients by adding the following values also as complex coefficients: d=number of gamma factors g((z+k1)/2), g((z+kd)/2), k followed by k1, ... kd, N the conductor, e the sign of the functional equation, and finally w the weight. h = -995 has the same parameters entered as complex numbers to allow for Dirichlet and Mass L-series with complex gamma factors and e terms. For L-functions with very rapidly growing coefficients which would cause numerical overflow (large weights) enter chr. no -996, scale down the coefficients of n by a factor n^(-sh) and enter sh as a shift factor after the weight. If you set an e with absolute value d other than 1 you will get d ^(-z)*L(z) which is useful for generating the full set of modular old forms (see my research article at the web site). If the imaginary part of the weight is set to 1 rather than 0 the powers of pi in the functional equation will be translated by the gamma factors or their conjugates. You can explore abstract L-function fractal sets, save an image and parameter file. You can then load the parameters for the image later after making sure you have first loaded the correct L-function and the existing abstract function will continue to operate. If the abstract L-function has 2 gamma factors of 0 and 1 respectively and Mellin is set, RZViewer will also use the Mellin transform for a modular form (or elliptic curve) in the region 0�x�w, -8�y�8 to improve fidelity in the central basin. This is useful for considering the Birch and Swinnerton-Dyer conjecture. Finally with version 1.7.3 a general Dokchitser type gamma function inverse Mellin transform routine has been instituted for arbitary L-functions which is currently experimental, but works successfully on the genus 2 and 3 examples. To activate this fullterms needs to be set to 4 in the parameter file. In both the modular and general cases, if the number of gamma factors is given a negative sign, the three terms after weight (or the shift factor with -996) will be the height and width of a Mellin transform window and the residue of any pole singularity at z=1. The easiest way to generate parameter files is by using a C-script, which will generate all the parameters from the L-function coefficients and gamma factors. Example C-scripts ready to run including elliptic curve, modular form and Maass form L-functions are provided in the attached files. The file “Installing&Running.txt” in the Computel folder gives working examples of generating a central region function portrait for the extension field of x^4-x^2-1 and the elliptic curve example 5077a. The Computel examples are designed to be able to be overlayed on the RZViewer image of the same function example using the coefficients and gamma functions generated by Computel in the example files and pasted into an appropriate C-script example in the fields folder. A C-script “overlay.c” is provided to facilitate merging the Computel bitmap over the RXViewer overview to give a high fidelity portrait. The Computel process is 14,500 times slower than RZViewer, so even a small central image will take 15 minutes or so to process. PARI-GP and a compiled version of the Computel algorithm for elliptic curve L-functions is also incorporated into the open source cross-platform math package Sage http://www.sagemath.org/ from which the coefficients for several of the templates were generated. Example scripts enabling coefficient generation for elliptic curves and modular forms is included with RZViewer, but Computel can also generate all the elliptic curve and field extension examples without having to install Sage. Bitmaps: You can both save and load bitmaps as well as parameter files and tiff images. You can save whole bitmaps as text files by using color option 5 and selecting the Save Bitmap menu item. These can then be merged, or overlayed and reloaded into RZViewer as bitmaps. The portrait will initially show in its exact size in pixels. Since it's a bitmap, blowing it up will reduce the resolution of individual pixels and you can’t use it to generate fractal sets. But this makes it possible to generate L-functions, which couldn't otherwise be accurately portrayed such as the echelon basis functions of modular forms. Terminal C-scripts are included with several of the modular form examples to enable merging of saved bitmaps as shown in the illustrations in http://dhushara.com/DarkHeart/key/weights.htm. As noted above, one can also use Computel to generate bitmaps, which can be merged with RZ portraits and loaded into RZViewer. The Sage file in the 57 folder shows the information to form the matrix expressing 57a, 57b, 57c, 19a and 19ax3 in terms of 57m0-4 and its inverse, thus enabling us to express the basis elements in terms of the elliptic curve eigenfunctions. 1: In RZViewer, load one of the above parameter files for the elliptic curves in the parameter file folder in 57, turn on full terms and open the advanced drawer. 2: Slide the window to downsize it to the smallest possible to avoid overflowing bitmap memory on reload. 3: Set color mode to 5 and set scale e.g. to 25 and click Set X,Y,S. 4: When the window has refreshed with the L-function profile, save the bitmap under the same name as the parameter file - e.g. "57a.txt". 5: Do the same for each of the 5 files. 6: Put all the o files in a folder along with merge57e.c open terminal and cd to the folder, then execute "gcc -o rzo merge57e.c -lm && ./rzo". The merge script is already set to use the input filenames you have defined. 8: Run the same c script again setting opt to 0 - 4 to generate 57m0.txt to 57m4.txt. 9: Upload each of these into RZViewer one at a time using Load Bitmap to view the results and save as required to get tiffs. Movie Sequence Formats: The text file consists of series of floating point numbers. (1) File format 1-3 (2) N<=1000 number of frames (3) 1/0 Mandelbrot/Julia followed by a sequence of frame parameters [ X, Y, Scale CX, CY]. Format 1: only the start and end parameters are specified and DHViewer will generate N frames in a linear sequence between these values. Format 2: the file supplies a series of N parameters on any trajectory, for instance computed values running around the cardioid of a Mandelbrot set. Format 1 and 2 files can either generate blowups of Mandelbrot sets or movies of Julia sets as CX and CY vary. The sequence file has no parameters except mandel, so you can set all the other settings manually before saving the movie. If you want to determine in advance the complete parameters for a movie run, save your parameters and load them before loading the movie sequence file. Format 3: The format file contains only parameters 1 & 2 and is accompanied by a series of full parameter files, generated by another application such as the C-scripts generated by Terminal in the files. If the format file is myfile.txt, the parameter files need to be numbered myfile0.txt - myfileN,txt. This format enables batch programming of any sequence of images automatically. This method enables exploration of a wide range of Mandelbrot sets of zeta functions intuitively taking advantage of the software algorithms without having to do complex arithmetic to look for the needle in the haystack. Step 1: Explore the critical points of the function using the dz derivative option. Choose a critical point and scale the image by dragging rectangles to focus on a small region around the critical point. If the critical point has strip-like artifacts due to function term round-off, tick the full terms option while the process is drawing the immediate neighbourhood. If the imaginary value is large, you may need to increase the function terms to get an accurate critical point. Step2: Tick the keep scope option and click the function twice right on the critical point to get Julia representation. This will insert the c value of the critical point into the Julia / Mand c text fields. Now tick Hold to lock these values in. Step 3: You now need to decide whether you are exploring an additive or multiplicative Mandelbrot set. Untick +c/xc if you are using multiplicative. Step 4: Untick dz so we are dealing with the original function (this didn't affect the Julia step because dz is active only in function mode) and do a Reset and then press Set R/I. This causes the critical point values to modify the zeta function causing the fixed values and principal point of the critical point to be zeros of the modified zeta transfer function. Step 5: Have a look initially at the principal point, which due to the maths is a double zero so has two yellow angular rays meeting in it. This is where one is most likely to easily find a principal Mandelbrot kernel. In the additive case the principal point will be quite close to the critical point because it only has an additive shift, but in the multiplicative case it may be rescaled and you will have to search for the double zero. You can insert a new Y value and click Set X,Y,S to move further up or down the imaginary axis. Step 6: With keep scope ticked, click the point once to go into Mandelbrot mode. Click Set R/I again to make sure the Mandelbrot is using the critical point you found. Drag a rectangle to zoom in on the neighbourhood of the point. This should give you a Mandelbrot kernel with reasonably well-formed bulbs, dendrites, and satellite black hearts if the number of function terms and iterations is high enough to be accurate at the values used. Step 7: You can now explore the region of the Mandelbrot kernel or its islands and can check the corresponding Julia kernels by clicking once on a spot with Hold unticked to pick up the actual c value you are now investigating. The Julia set may have only very tiny connected periodic kernels representing the local dynamics near the Mandelbrot kernel and in the multiplicative case these may appear only in a region of the Julia set close to the principal point. Step 8: You can also find a critical value to use with crVal by locating the critical point as a zero of dz scaling down to a microscopic domain around it and unchecking dz and refreshing to give the value of the function, which is stationary at the critical point. This can then be found by saving a bitmap and viewing it as a text file where the stationary value will be at the midpoint (see bitmaps below). Use the smallest size screen for a smaller bitmap. Selected critical values for zeta are included below. Movie frames are generated as tiff images, which can be turned into Quicktime movies with Quicktime Player pro 7's "open image sequence" option, or loading them collectively as files using Mpeg Stream clip, which is included with the package. If terminal doesn�t recognize the gcc command, open an Apple Developer account (free) and install Mac OSX Command Line Tools for your system from https://developer.apple.com/download/more. The number of function terms can also be adjusted to large exact values to show up anomalous behavior, for example the 84270 term zeta product up to the prime 1079999, has a value at the first zeta zero of 6.25, well above 0. That for the 1518898th prime 24199999 is a stunning 20067241.5306, anything but 0! RZViewer uses functional equations for analytic continuation to the left of the critical line, but also selectively applies Mellin transforms to the central basin of Dirichlet, Hecke, and modular L-functions and the Dedekind zeta. This gives a good compromise of rapid computation with central smoothing. Tim Dokchitser’s Computel algorithm included in RZViewer as an adjunct package, using advanced generalized Mellin transforms, is accurate at depicting the zeros at the centre and in the critical strip for a wider collection of L-functions. The following gives a summary of the analytic continuations and Mellin integral transforms for Riemann zeta, Dirichlet L-functions, Dedekind zeta, Hecke L-functions on Gaussian integers, and for the L-functions of elliptic curves and modular forms used in the package. 1. Exploding the Dark Heart of Chaos http://dhushara.com/DarkHeart/DarkHeart.htm An exploration of the universality of the cardioid at the centre of the Mandelbrot set extended to the diversity of complex analytic functions with Mac XCode applications and Quicktime movies illustrating each example. 2. Fractal Geography of the Zeta Function http://dhushara.com/DarkHeart/geozeta/zetageo.htm The quadratic Mandelbrot set has been referred to as the most complex and beautiful object in mathematics and the Riemann Zeta function takes the prize for the most complicated and enigmatic function. Here we elucidate the spectrum of Mandelbrot and Julia sets of Zeta, to unearth the geography of its chaotic and fractal diversities, combining these two extremes into one intrepid journey into the deepest abyss of complex function space. 3. Experimental Observations on the Riemann Hypothesis and the Collatz Conjecture http://dhushara.com/DarkHeart/RH2/RH.htm This paper seeks to explore whether the Riemann hypothesis falls into a class of putatively unprovable mathematical conjectures, which arise as a result of unpredictable irregularity and to provide an experimental basis to discover some of the mathematical enigmas surrounding these conjectures. 4. A Dynamical Key to the Riemann Hypothesis http://dhushara.com/DarkHeart/key/key2.htm This sets out a dynamical basis for the non-trivial zeros of the Riemann zeta function being on the critical line x = 1⁄2. It does not prove the Riemann Hypothesis (RH), but it does give a dynamical explanation for why zeta and the Dirichlet L-functions do have their non-trivial zeros on the critical line and why other closely related functions do not. It suggests RH is an additional unprovable postulate of the number system, similar to the axiom of choice, associated with the limiting behavior of the primes as . 5. The Physics and Computational Exploration of Zeta and L-functions http://dhushara.com/DarkHeart/dynamical/dynamical.htm This article presents a spectrum of 4-D global portraits of a diversity of zeta and L-functions, using currently devised numerical methods and explores the implications of these functions in enriching the understanding of diverse areas in physics, from thermodynamics, and phase transitions, through quantum chaos to cosmology. The Riemann hypothesis is explored from both sides of the divide, comparing cases where the hypothesis remains unproven, such as the Riemann zeta function, with cases where it has been proven true, such as Selberg zeta functions. 2. Boyd Suzanne, Henriksen Christian (2012) The Medusa Algorithm For Polynomial Matings Conformal Geometry And Dynamics 16, 161–183 arXiv:1102.5047 http://www.math.cornell.edu/~dynamics/Matings/. 3. Brown D, Halstead M (2007) Super-attracting cycles for the cosine-root family Chaos, Solitons and Fractals 31 1191-1202. 4.Buff X, Henriksen C (2001) Julia Sets in Parameter Spaces Communications in Mathematical Physics https://www.math.univ-toulouse.fr/~buff/Preprints/JuliaCubic/Copies.pdf . 5. Devaney R et al. (2013) Sierpinski curve Julia sets for quadratic rational maps arXiv: 1109.0368. 7. Douady A Hubbard J (1985) On the dynamics of polynomial-like mappings Annales scientifiques de l'ENS 18/2 287-343. 8. Durkin M. (1998) Observations on the dynamics of the complex cosine-root family J. Differenc Equat Appl 4 215-28. 9. Epstein A., Yampolsky, M. (1996) Geometry of the Cubic Connectedness Locus I: Intertwining Surgery arXivMath/9608213v1. 11. Lei T (1992) Matings of quadratic polynomials Ergod. Th. & Dynam. Sys. 12 589-620. 12. Milnor J (1993) Geometry and Dynamics of Quadratic Rational Maps Expr. Math. 2/1 37-83. 13. Milnor J (1992) Remarks on Iterated Cubic Maps Expr. Math. 1/1 5-24. 14. Pérez-Marco R (1997) Fixed points and circle maps Acta Mathematica 179/2 243-294. 16. Romera M et al. (2004) External arguments of Douady cauliflowers in the Mandelbrot set Computers & Graphics 28/3 437-449. 17. Romera M, Pastor G, Alvarez G, Montoya F (2006) External arguments in the multiple-spiral medallions of the Mandelbrot set Computers & Graphics 30 460-469. 18. Schleicher D. Zakeri S.(2000) "On biaccessible points in the Julia set of a Cremer quadratic polynomial." Proc. AMS 128/3 933-937. 19. Siegel C (1942) Iterations of analytic functions Ann. Math. 43 607-612. 20. Shishikura M (1991) The Hausdorff Dimension Of The Boundary Of The Mandelbrot Set And Julia Sets Annals of Mathematics 147/2 225-267 arXiv:math/9201282. 21. Shishikura M (2014) Dynamical charts for irrationally indifferent fixed points of holomorphic functions http://math.bu.edu/keio2014/talks/Shishikura.pdf. Movie frames are generated as tiff images, which can be turned into Quicktime movies with Quicktime Player pro 7's "open image sequence" option, or loading them collectively as files using Mpeg Steram clip, which is included with the package. If terminal doesn�t recognize the gcc command, open an Apple Developer account (free) and install Mac OSX Command Line Tools for your system from https://developer.apple.com/download/more. You need to make sure the correct parameters are put in the script. You can easily save a confirguration and look at the text file to check against the file structure. For example note that some variables are multiplexed specs in Dark Heart and  and  in Riemann Zeta. For extreme floating point values, replace the fprintf("%f") command by "%e" to get scientific precision. int frames = 41; //number of movie frames - normally use 500-1000! int frames = 121; //number of movie frames - normally use 500-1000! const int frames = 5; //number of movie frames - normally use 500-1000!